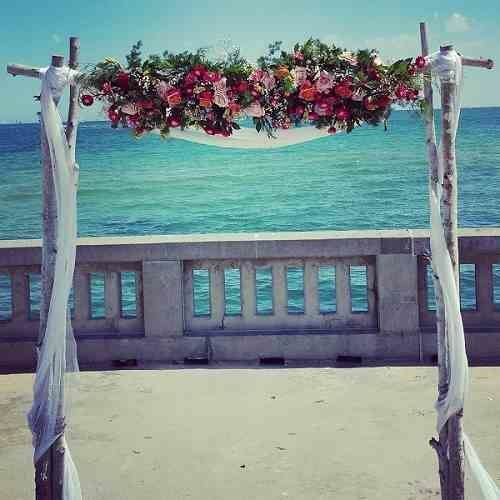 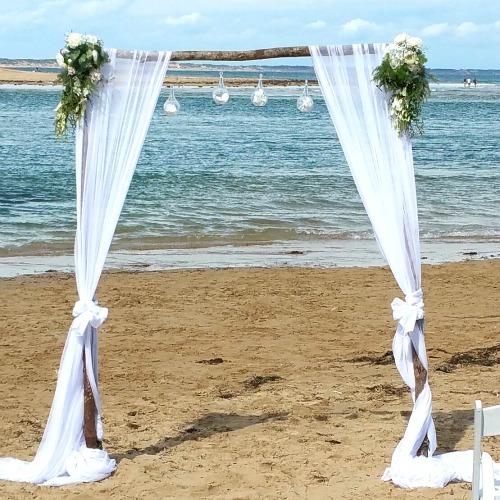 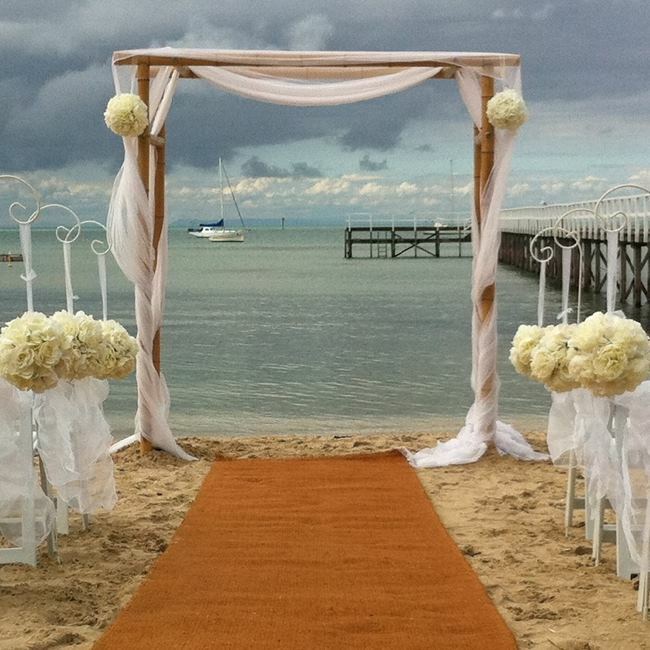 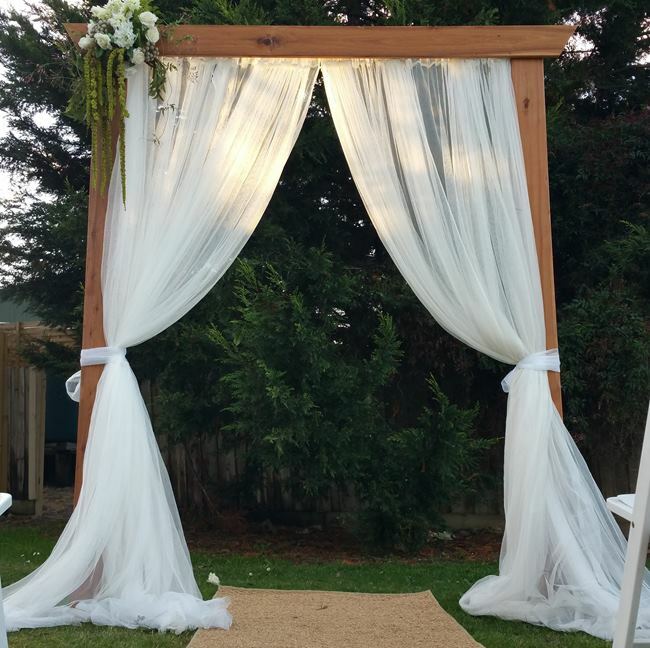 A wedding arch is perfect for an outdoor wedding ceremony. 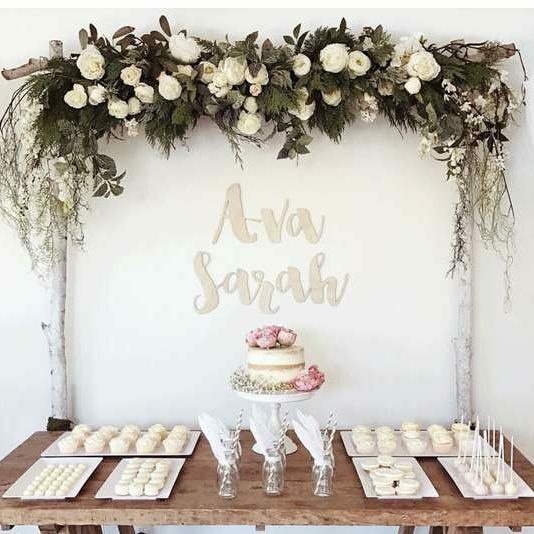 With so many options and so many different styles you can really show off your theme from the minute your guests first arrive. 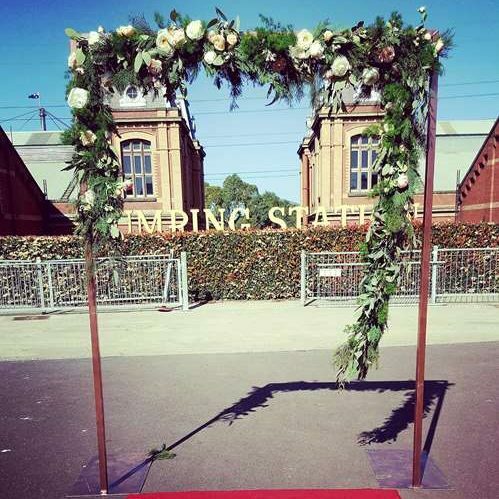 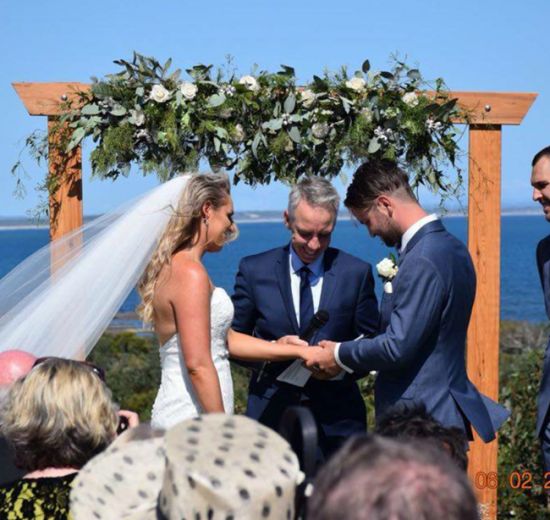 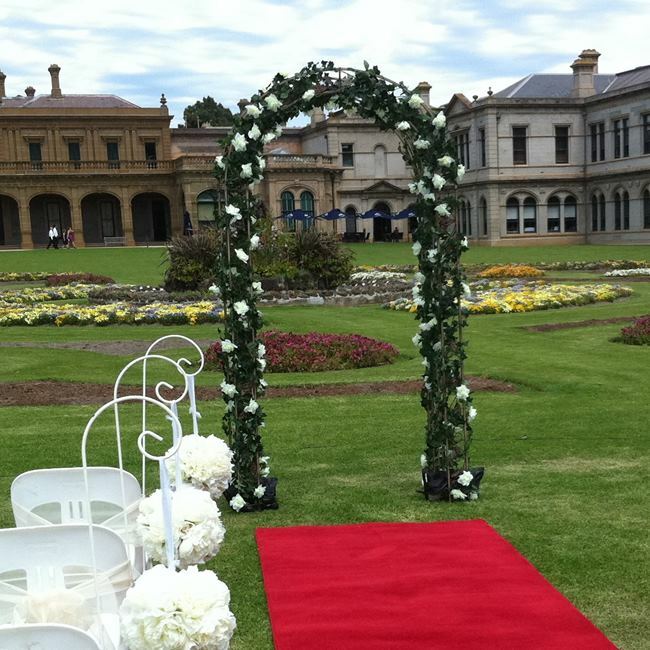 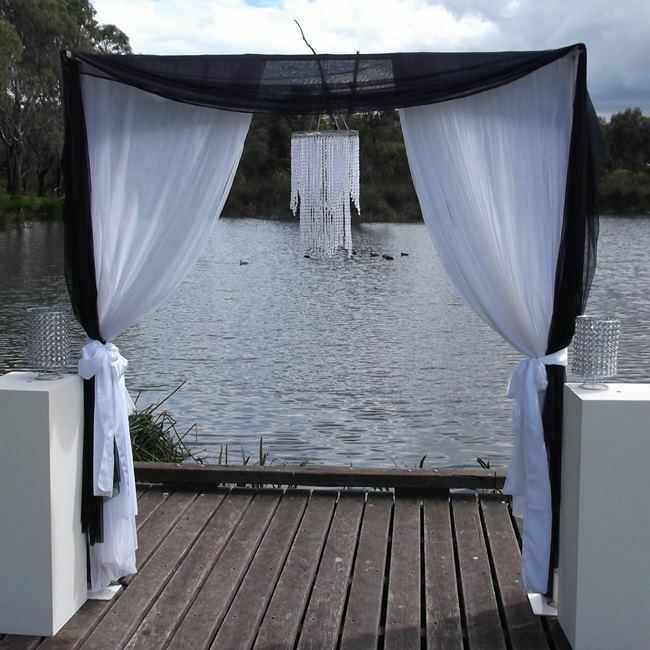 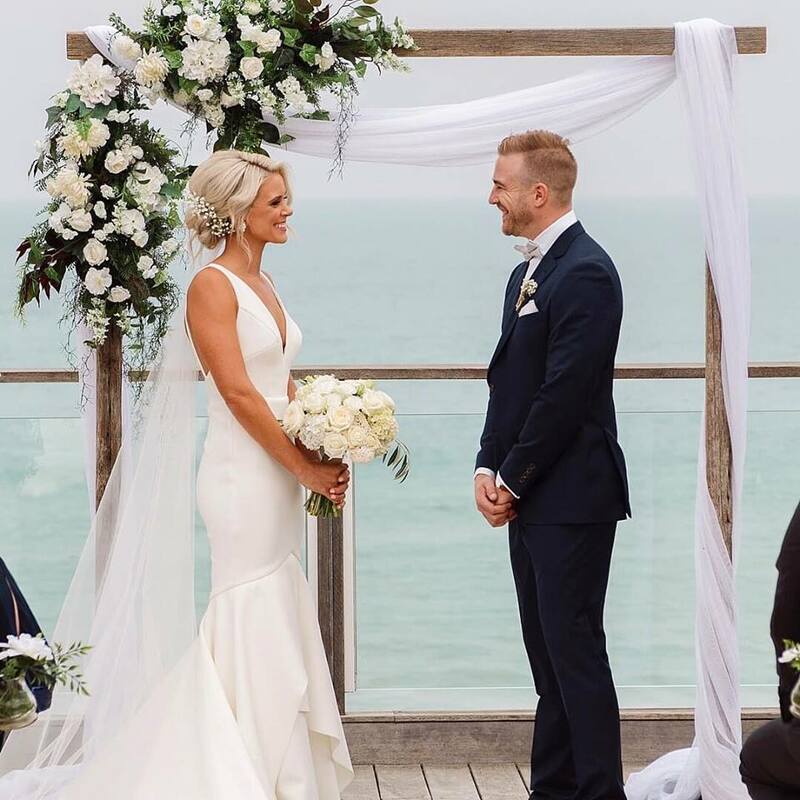 If you’re looking for a Wedding arch hire in Melbourne and surrounds, then you’ve come to the right place. 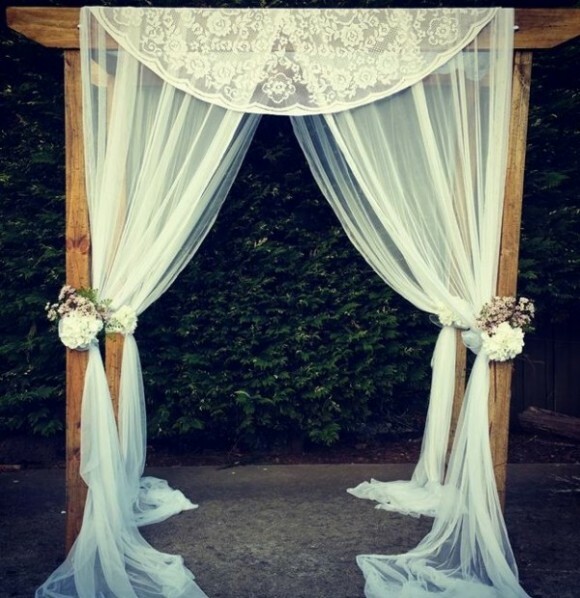 We have a huge range of wedding arches, wedding arbours and wedding backdrops for hire. 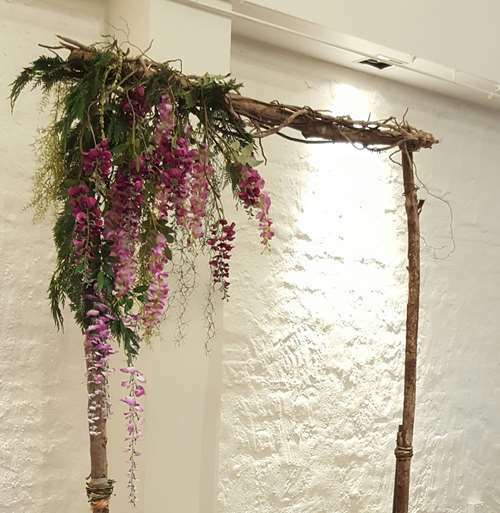 Our wedding arch hire can be done as DIY or can be fully styled and set up for you. 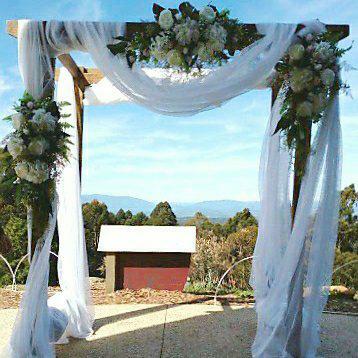 WEDDING ARCH OPTION 1- Gold metal wedding arbour with 2 large flower arrangements. 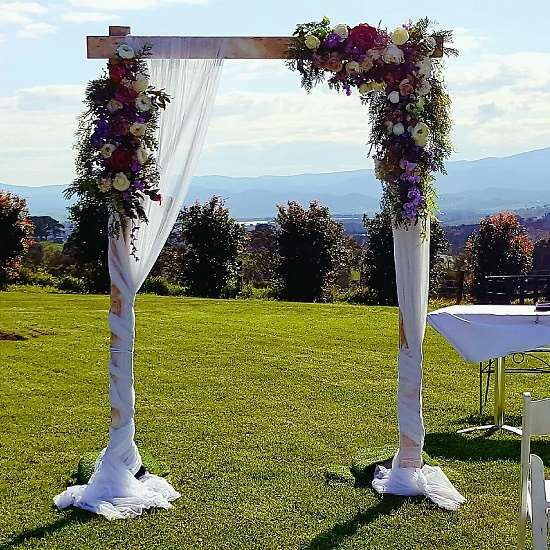 Styled with artificial flowers $490.00 Delivery and set up/pack down fees apply To save on costs this is also available as a DIY option for you to pick up yourselves. 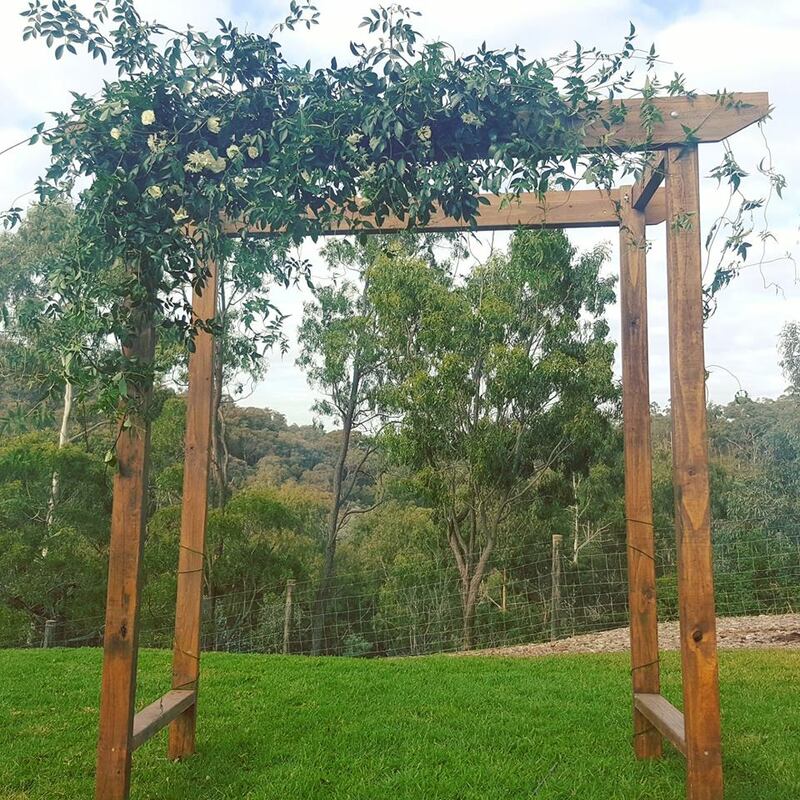 WEDDING ARCH HIRE OPTION 2 Birch wedding arbour with white flowers and foliage across the top bar $290.00 Delivery and set up/pack down fee apply. 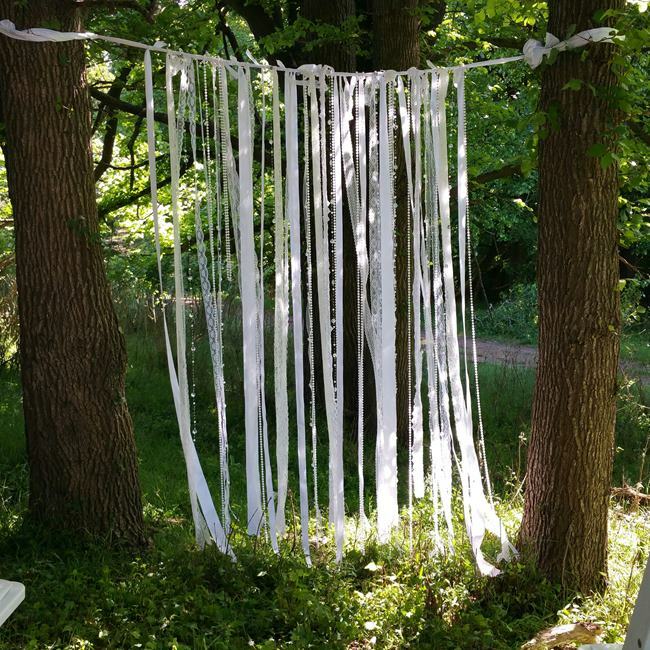 To save on costs this is also available as a DIY option for you to pick up yourselves. 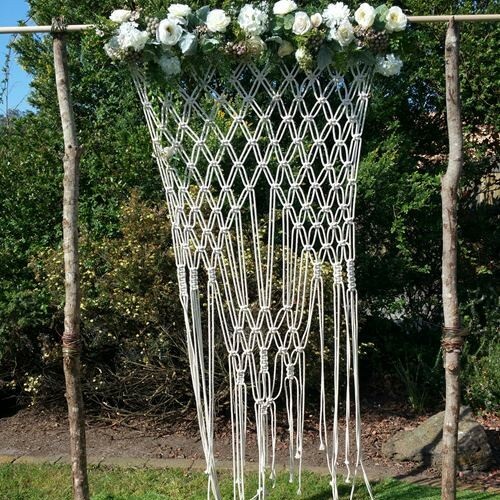 WEDDING ARCH OPTION 4-Macramé Boho Wedding Arbour with white artificial flowers $290.00 Delivery and set up/pack down fee apply. 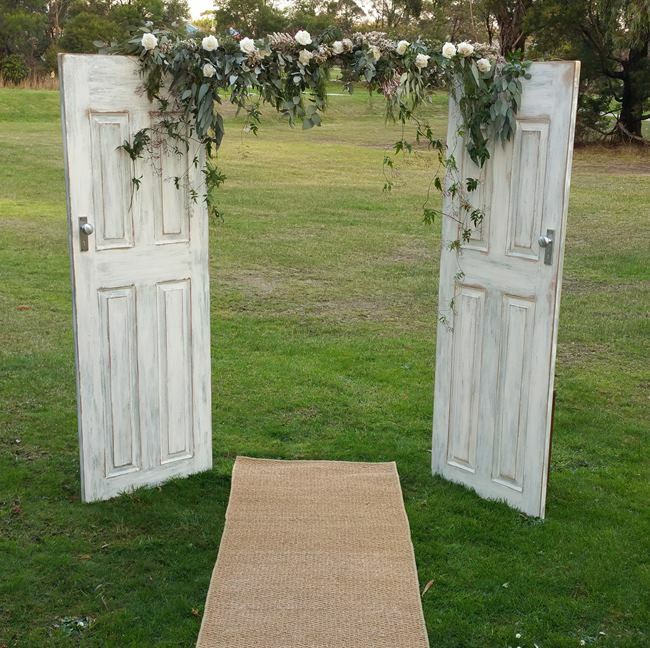 To save on costs this is also available as a DIY option for you to pick up yourselves. 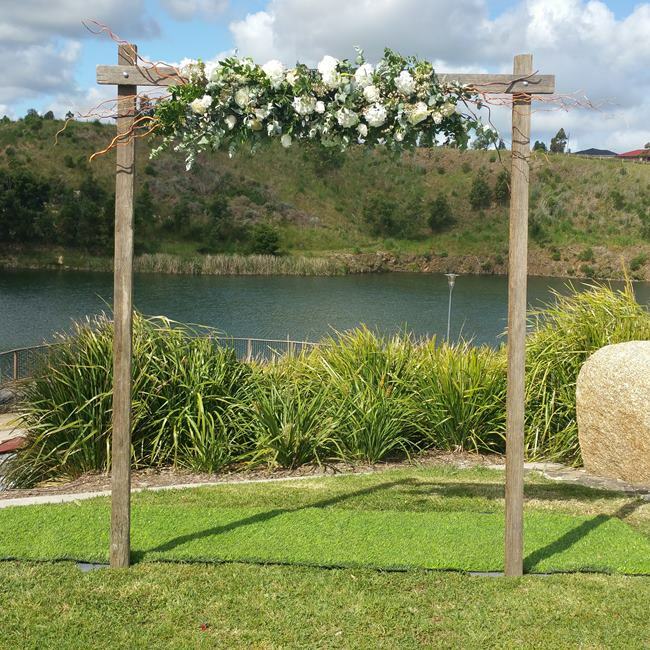 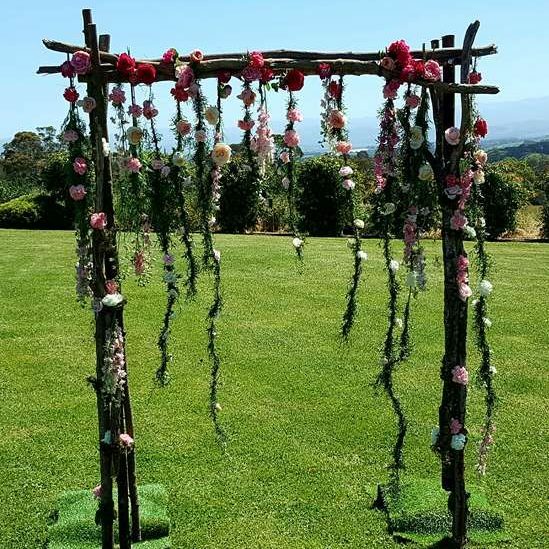 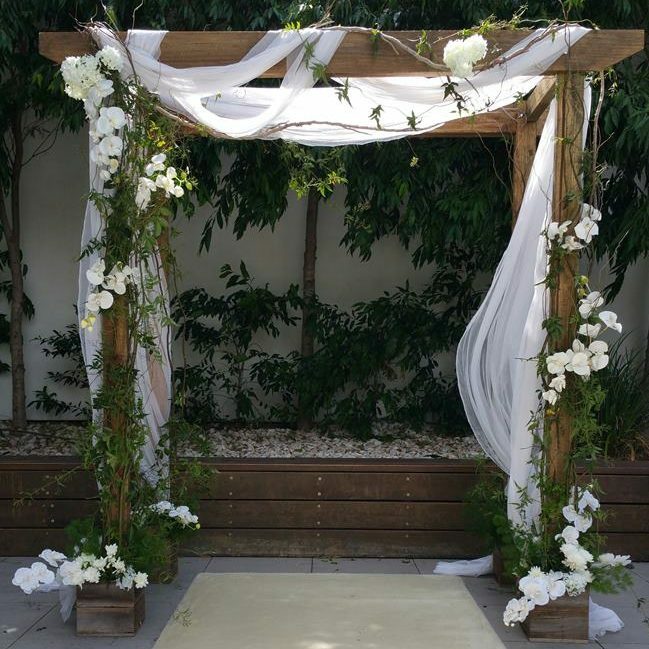 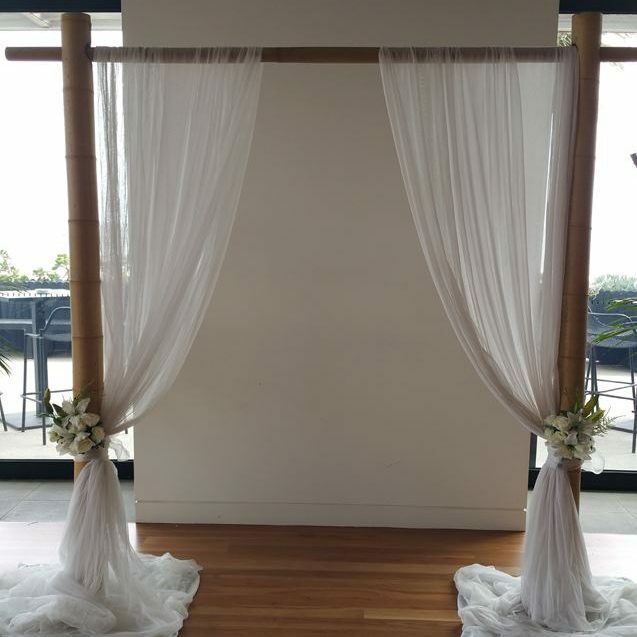 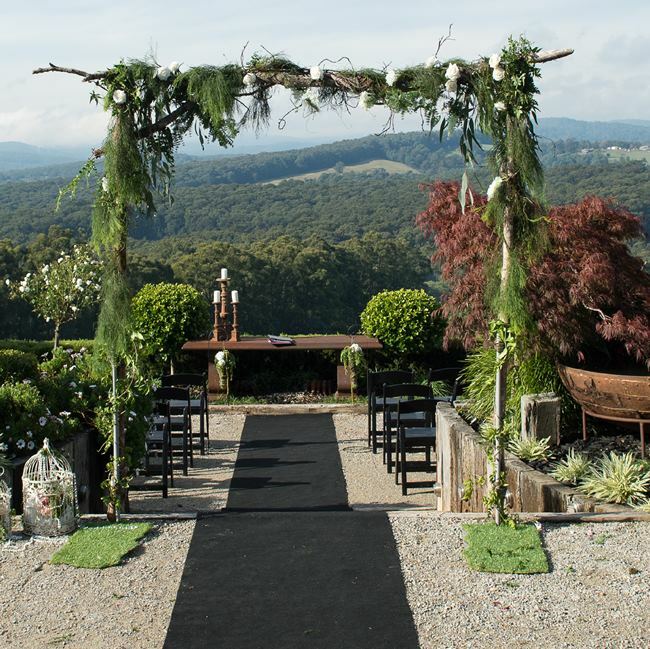 WEDDING ARCH HIRE 5 Macramé Wedding Arbour with flowers and foliage in the centre Styled with artificial flowers $290.00 Delivery and set up/pack down fee apply To save on costs this is also available as a DIY option for you to pick up yourselves. 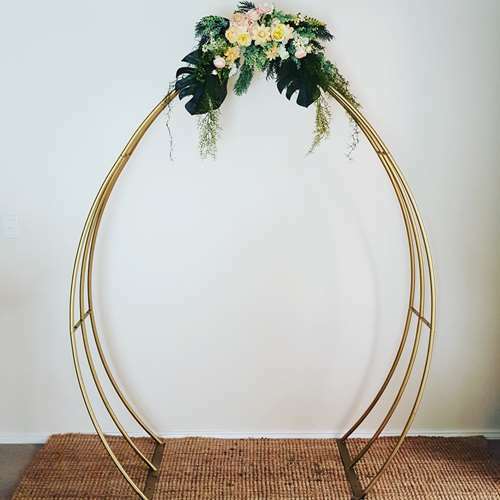 WEDDING ARCH OPTION 7- Gold metal Arbour with flowers and Pampas Styled with artificial flowers $490.00 Delivery and set up/pack down fee apply To save on costs this is also available as a DIY option for you to pick up yourselves. 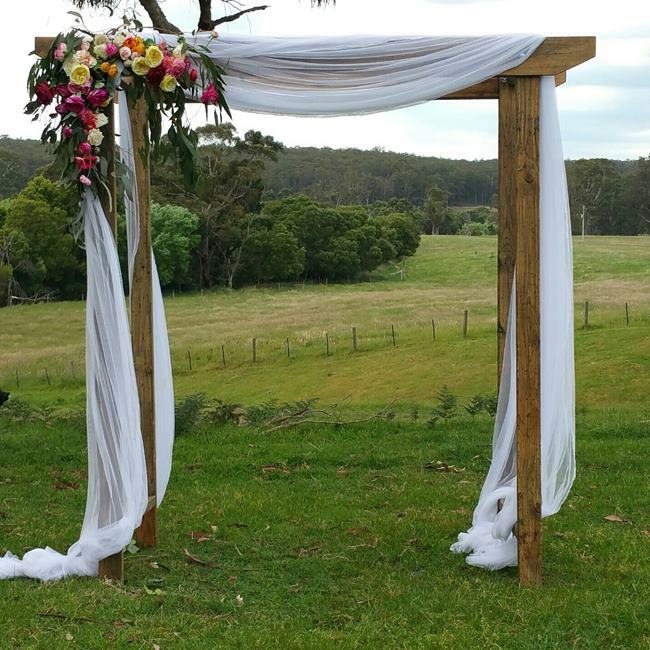 WEDDING ARCH OPTION 8- Wooden wedding arbour with white corner flowers and white material. 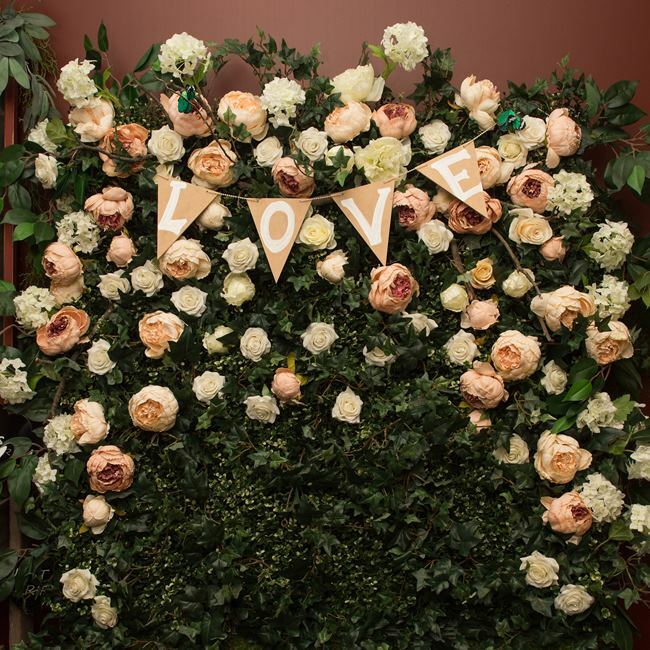 Styled with artificial flowers $320.00 Delivery and set up/pack down fee apply To save on costs this is also available as a DIY option for you to pick up yourselves. 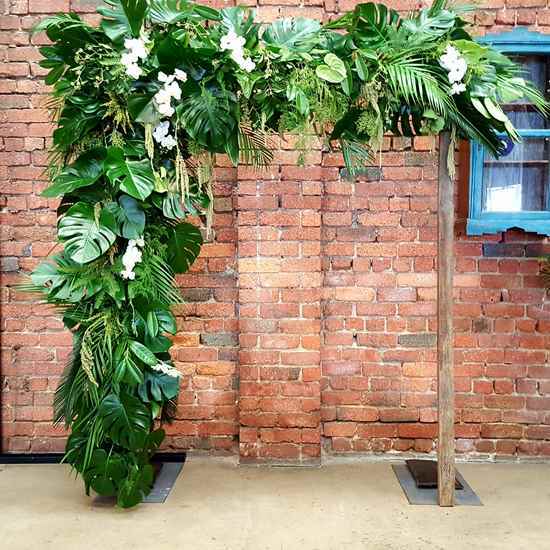 WEDDING ARCH HIRE OPTION 9 wooden wedding arbour with fresh Monstera leaf and a mixture of tropical foliage. 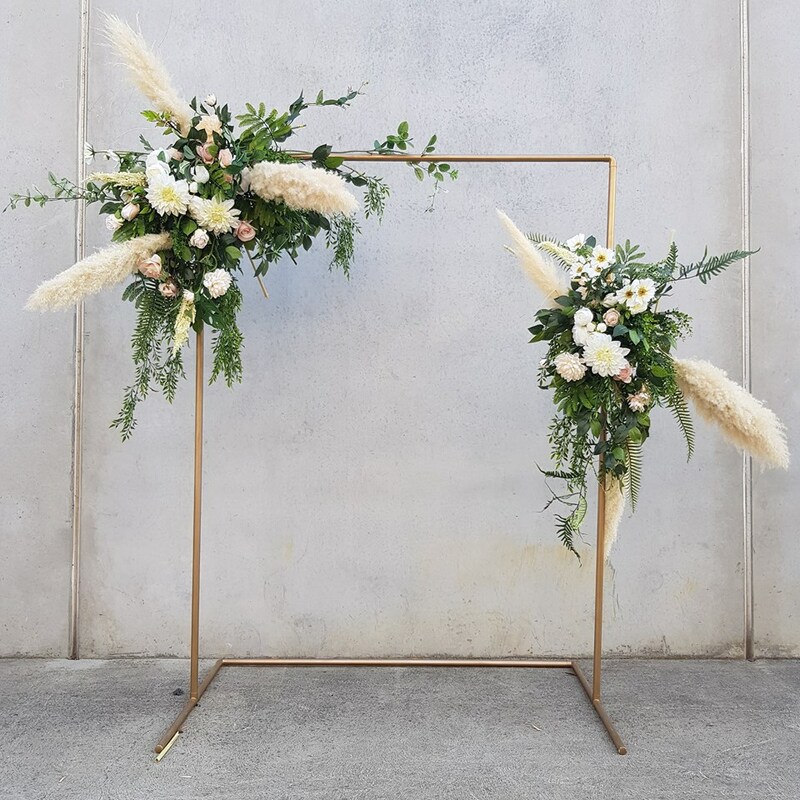 Styled with fresh foliage from $790.00 Delivery and set up/pack down fee apply To save on costs this is also available as a DIY option for you to pick up yourselves. 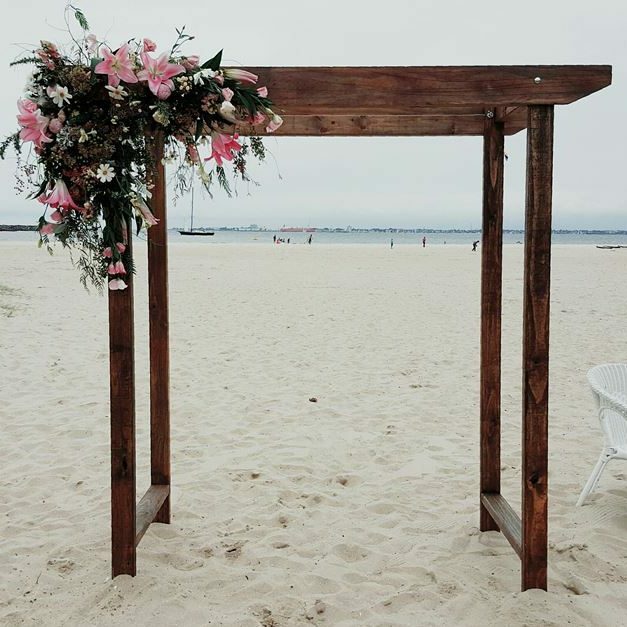 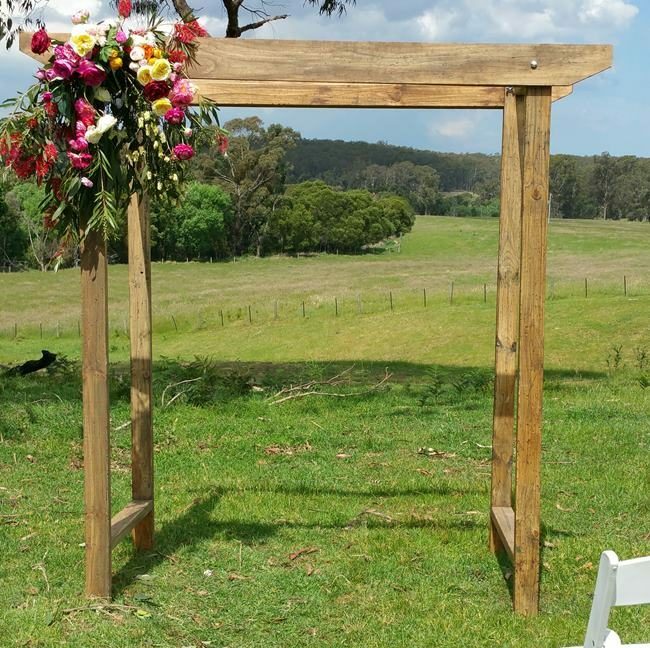 WEDDING ARCH HIRE OPTION 10 wooden wedding arbour with large corner flowers Styled with artificial flowers $320.00 Delivery and set up/pack down fee apply To save on costs this is also available as a DIY option for you to pick up yourselves. 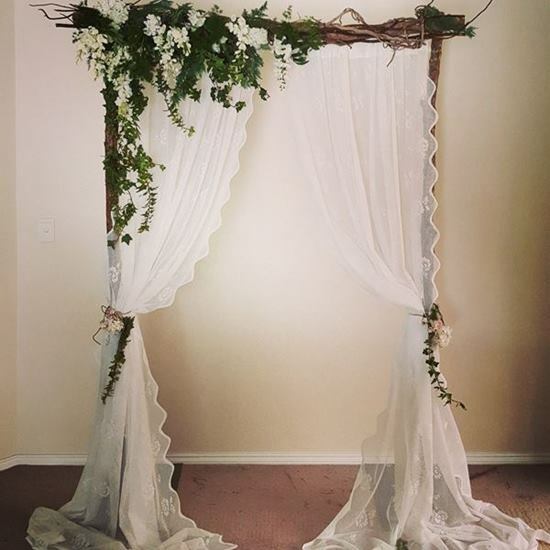 WEDDING ARCH OPTION 16-Rustic Wedding Back drop. 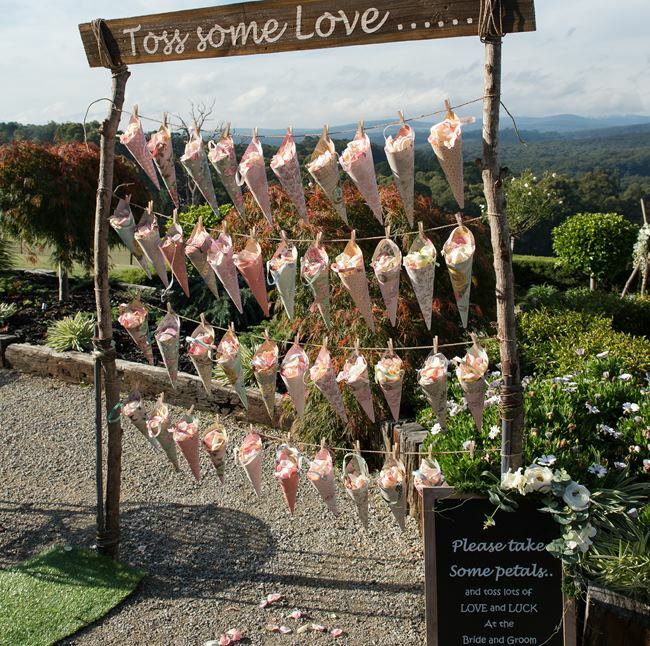 Comes with white draping material, artificial flowers on each corner, hanging Glass teardrops and a heart to hang in the middle. 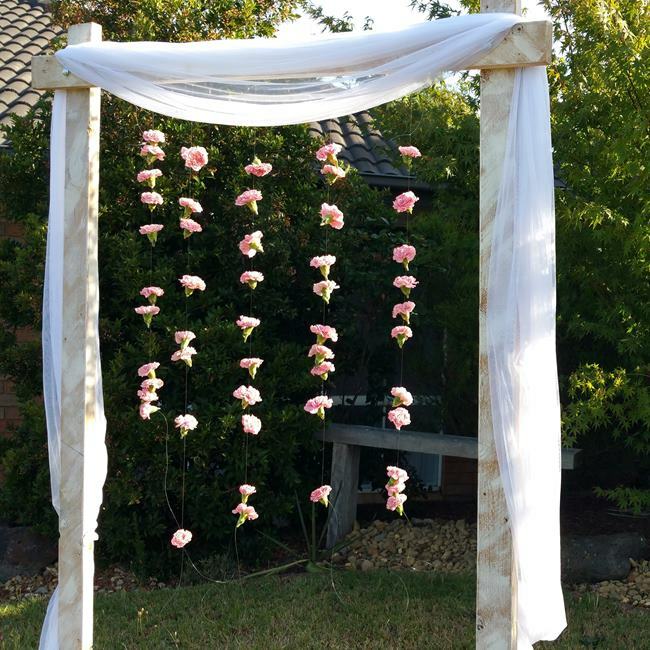 Styled with artificial flowers $290.00 Delivery and set up/pack down fee apply To save on costs this is also available as a DIY option for you to pick up yourselves. 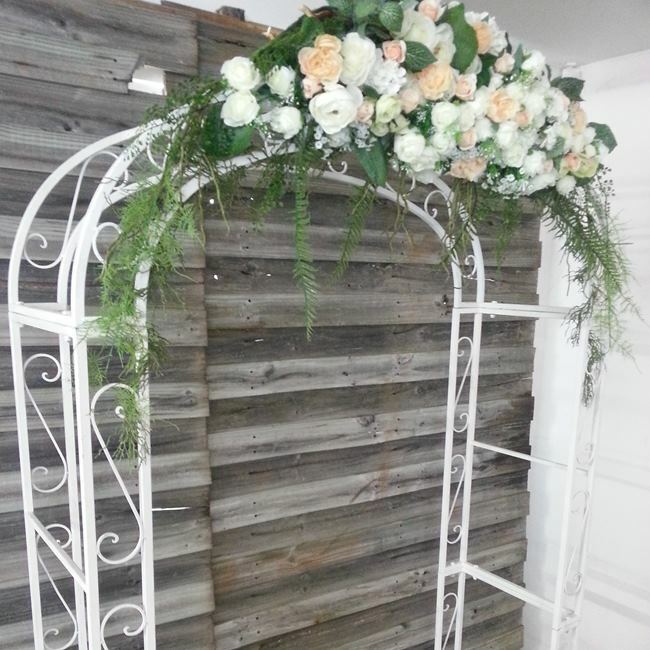 WEDDING ARCH HIRE OPTION 37- Metal Wedding arch with white flowers plus added colour Styled with artificial flowers $290.00 Delivery and set up/pack down fee apply To save on costs this is also available as a DIY option for you to pick up yourselves. 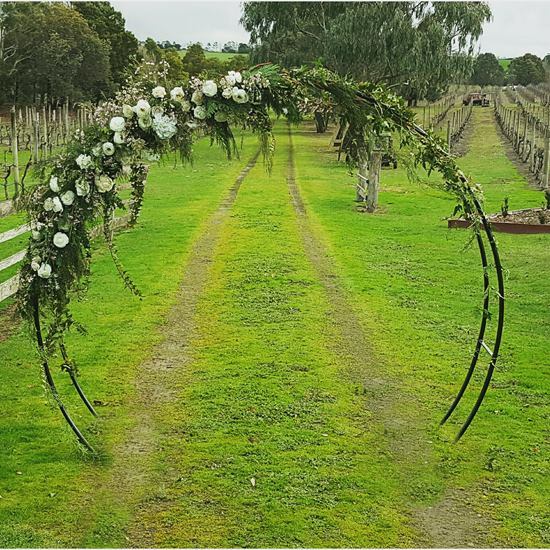 WEDDING ARCH HIRE OPTION 38- Metal Wedding arch with white flowers plus added colour Styled with artificial flowers $290.00 Delivery and set up/pack down fee apply To save on costs this is also available as a DIY option for you to pick up yourselves. 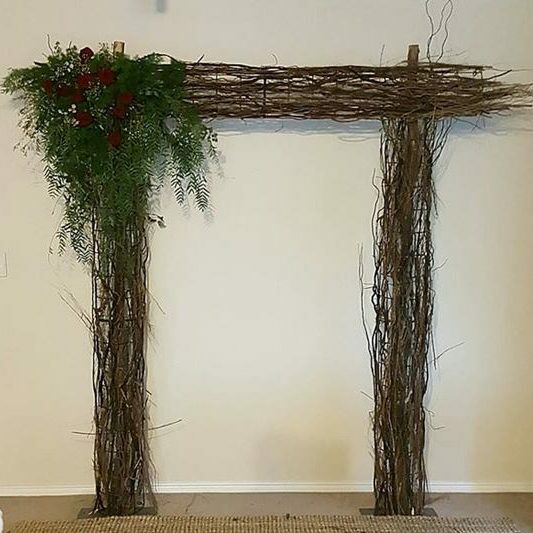 WEDDING ARCH OPTION 42- Rustic Rosette Wedding back drop This wedding back drop is made with natural branches. 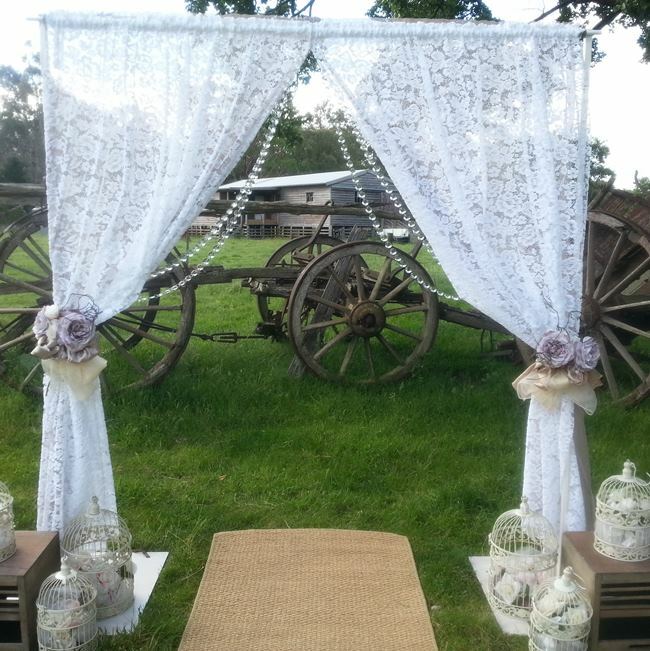 The organza curtains have rosettes on the top. 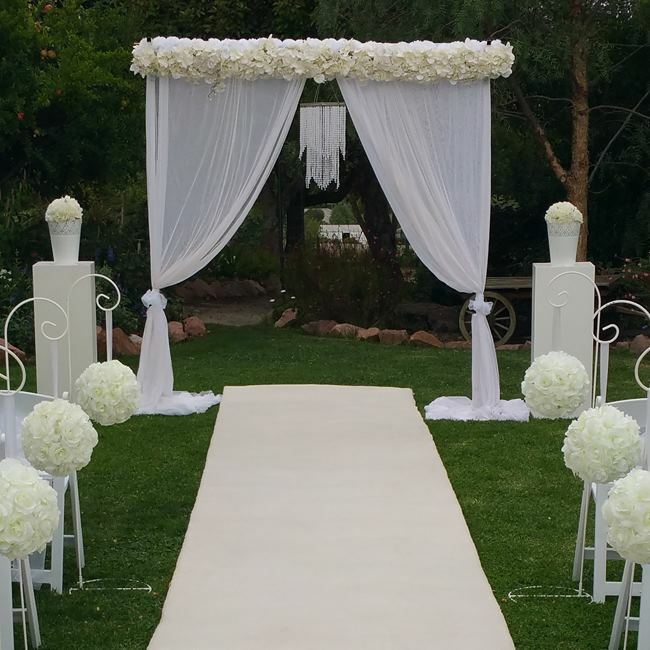 Flowers on each corner are included. 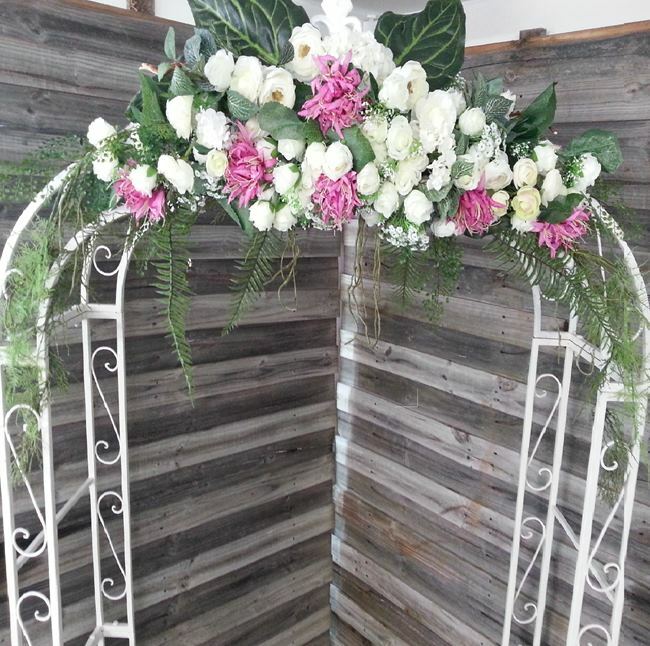 Styled with artificial flowers $290.00 Delivery and set up/pack down fee apply To save on costs this is also available as a DIY option for you to pick up yourselves. 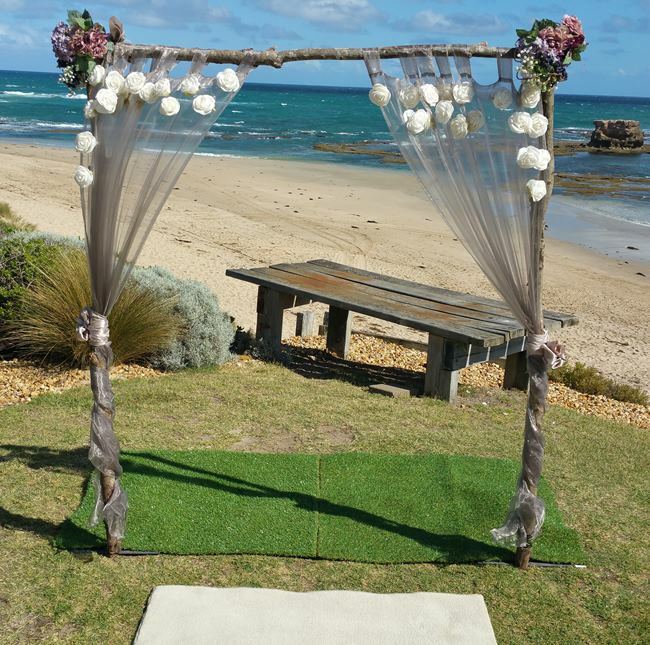 WEDDING ARCH HIRE OPTION 43 Hanging Ribbon and pearl Back drop. 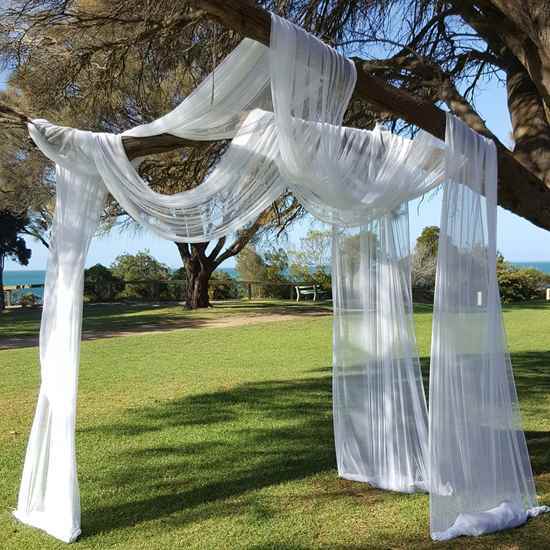 This back drop can be hung between two trees or displayed on stands. 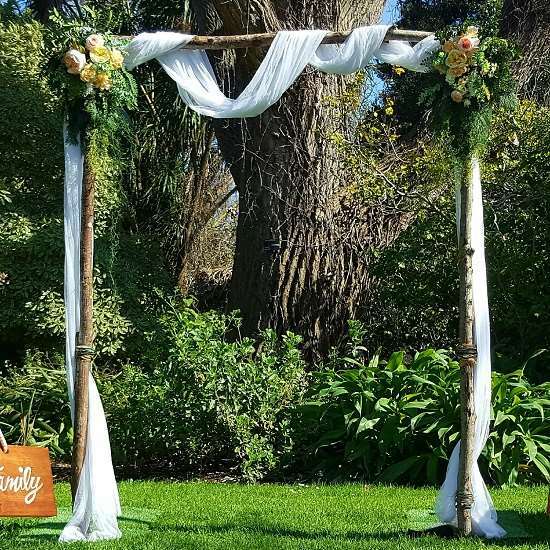 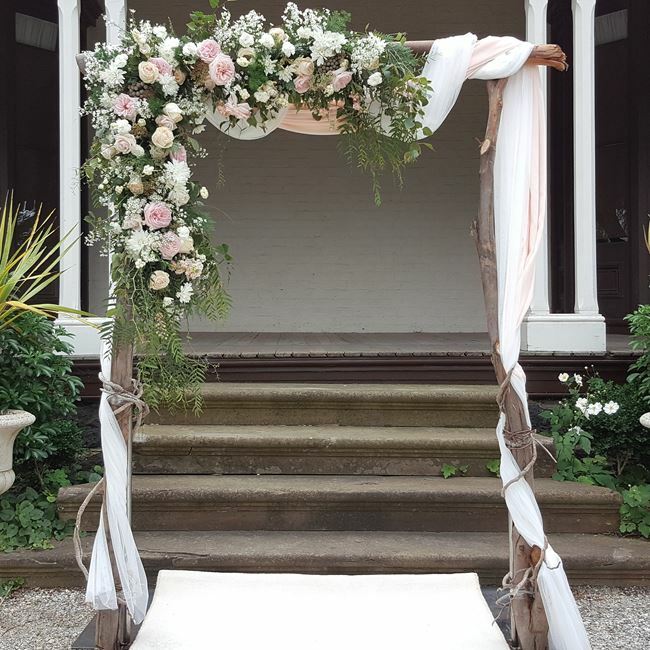 WEDDING ARCH HIRE OPTION 44-Wooden Wedding Arbour with large corner shaped flowers and foliage, comes with draping material. 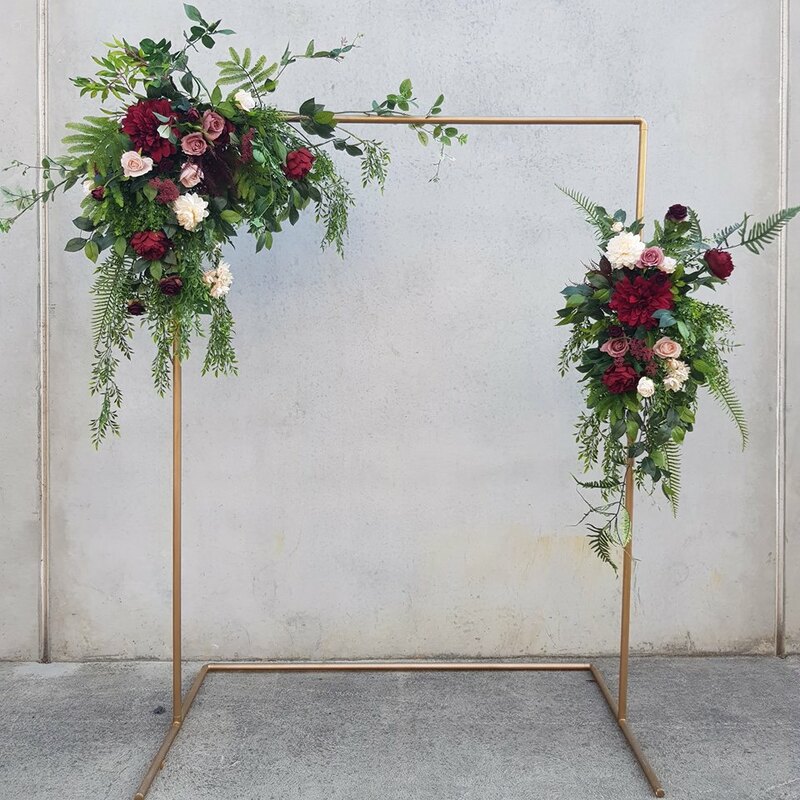 Styled with artificial flowers $320.00 Delivery and set up/pack down fee apply To save on costs this is also available as a DIY option for you to pick up yourselves. 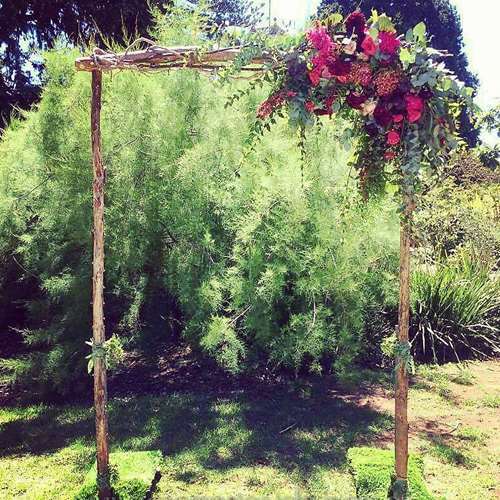 WEDDING ARCH HIRE OPTION 47-Wooden Wedding Arbour with flowers and foliage across the top bar. 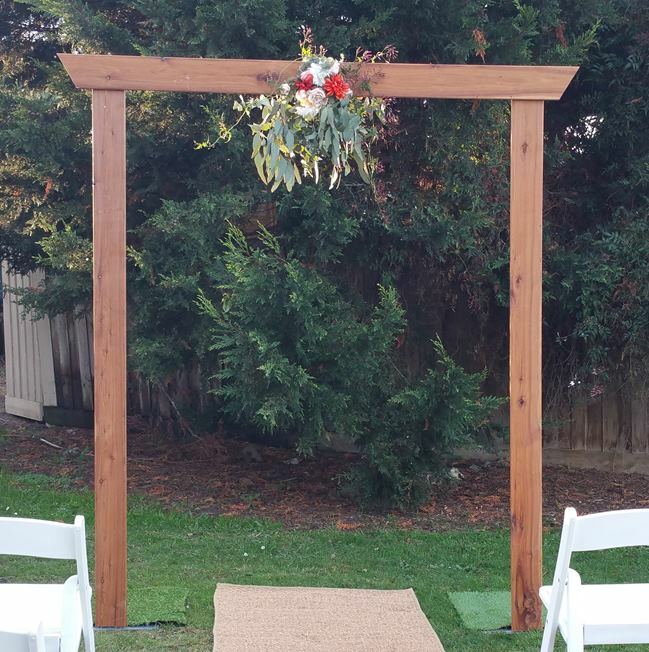 Styled with artificial flowers $290.00 Delivery and set up/pack down fee apply To save on costs this is also available as a DIY option for you to pick up yourselves. 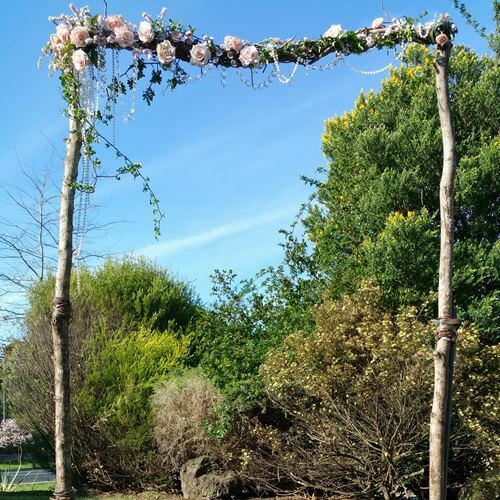 WEDDING ARCH HIRE OPTION 48-Wooden Wedding Arbour with large corner shaped flowers and foliage on bare timber. 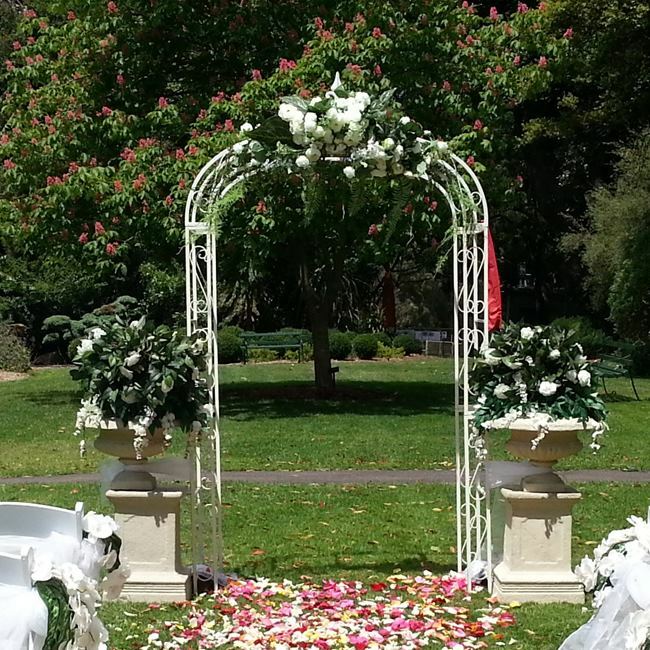 Flower colours of your choice. 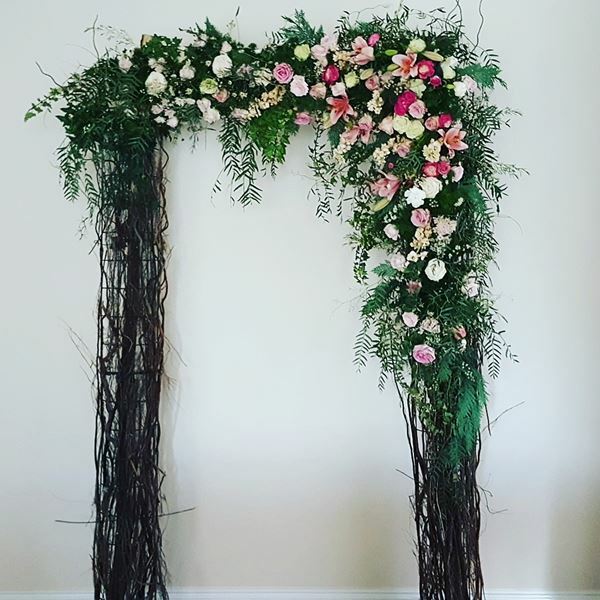 Styled with artificial flowers $320.00 Delivery and set up/pack down fee apply To save on costs this is also available as a DIY option for you to pick up yourselves. 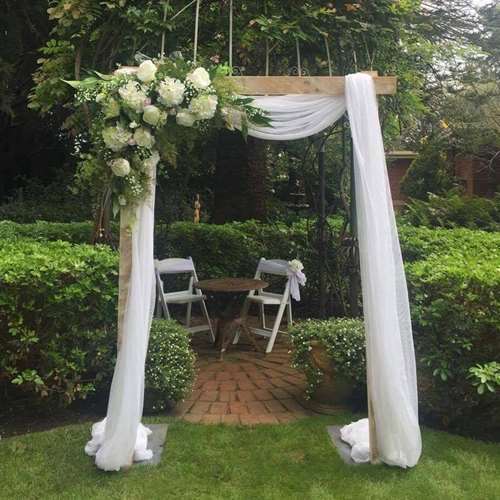 WEDDING ARCH HIRE OPTION 52 – White wash arbour with hanging carnations and white material. 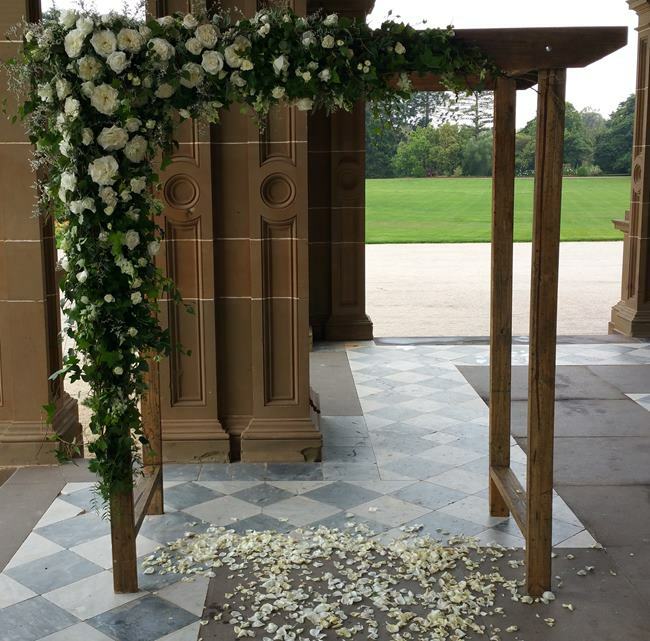 WEDDING ARCH HIRE OPTION 53- White wash arbour with fresh corner flowers and white material. 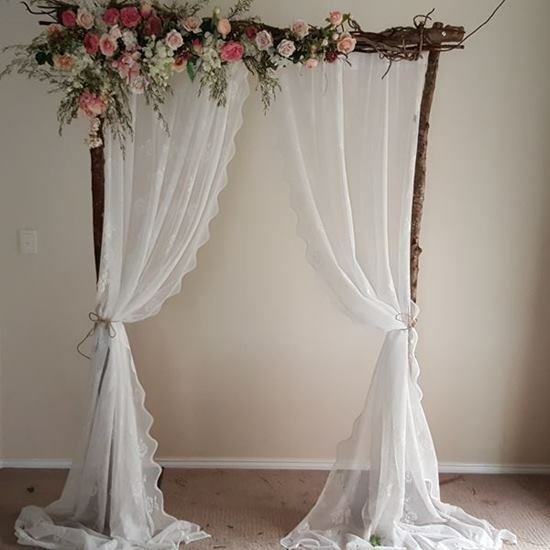 WEDDING ARCH OPTION 56-Made with natural branches 4 hanging tear drops, white material and flowers Styled with artificial flowers $290.00 Delivery and set up/pack down fee apply To save on costs this is also available as a DIY option for you to pick up yourselves. 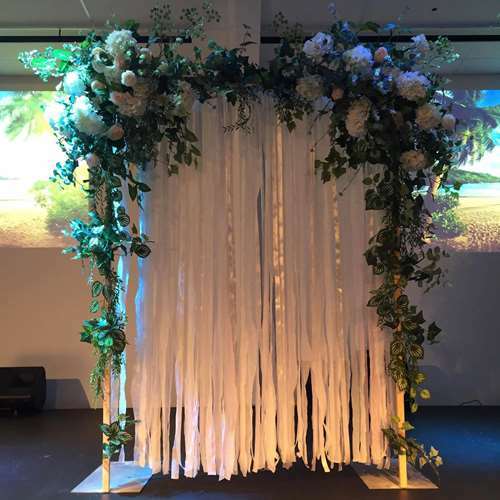 WEDDING ARCH HIRE 57- Made with natural branches, white draping material and flowers Styled with artificial flowers $290.00 Delivery and set up/pack down fee apply To save on costs this is also available as a DIY option for you to pick up yourselves. 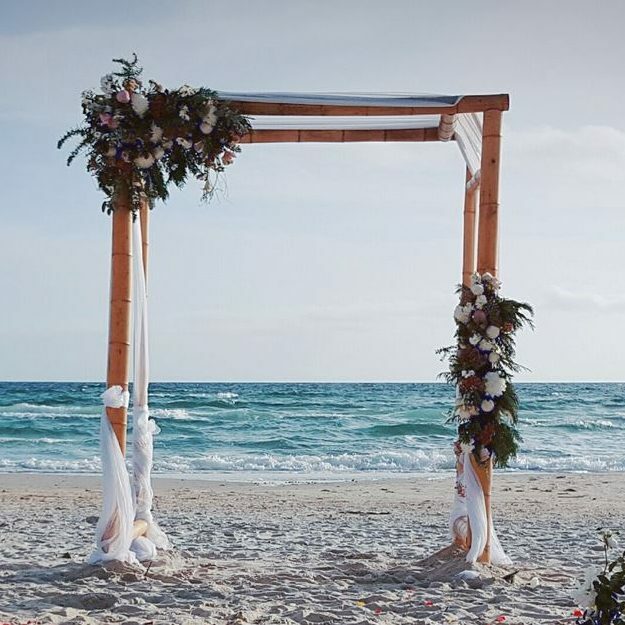 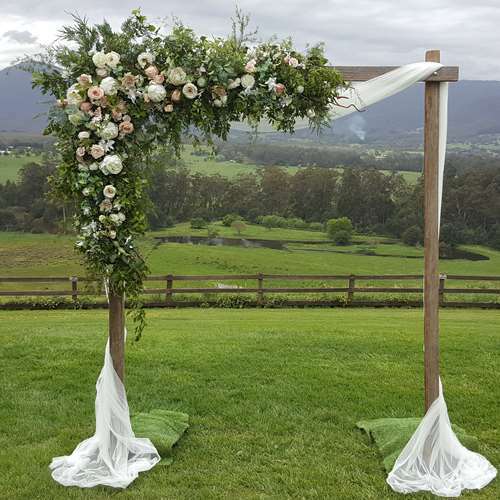 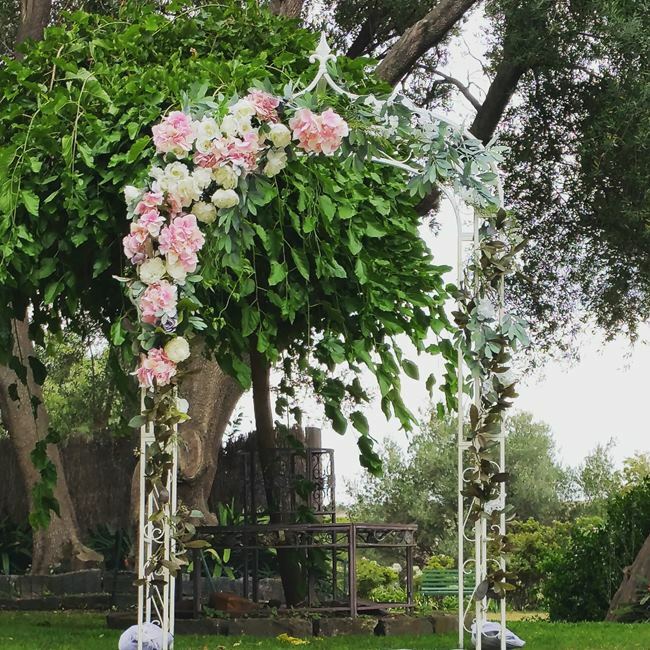 WEDDING ARCH HIRE 61 Birch wedding arbour with flowers and gum Styled with artificial flowers $290.00 Delivery and set up/pack down fee apply To save on costs this is also available as a DIY option for you to pick up yourselves. 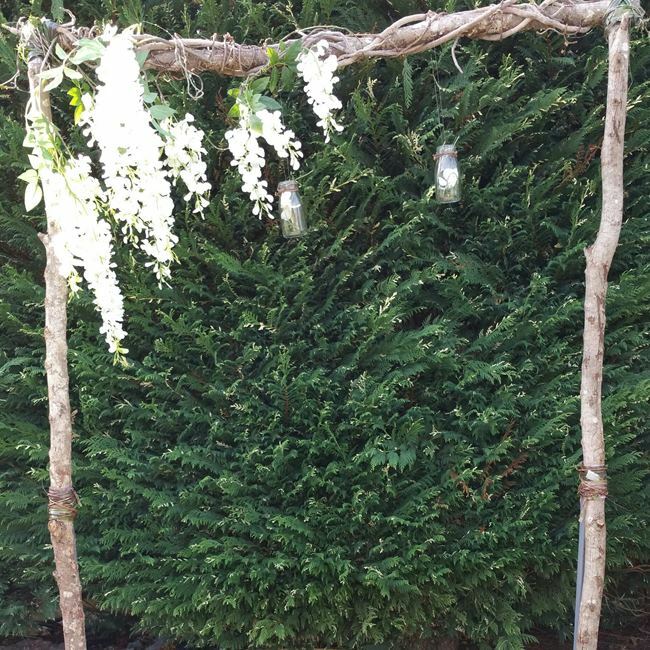 WEDDING ARCH HIRE 62 Birch wedding arbour with flowers along the top bar. 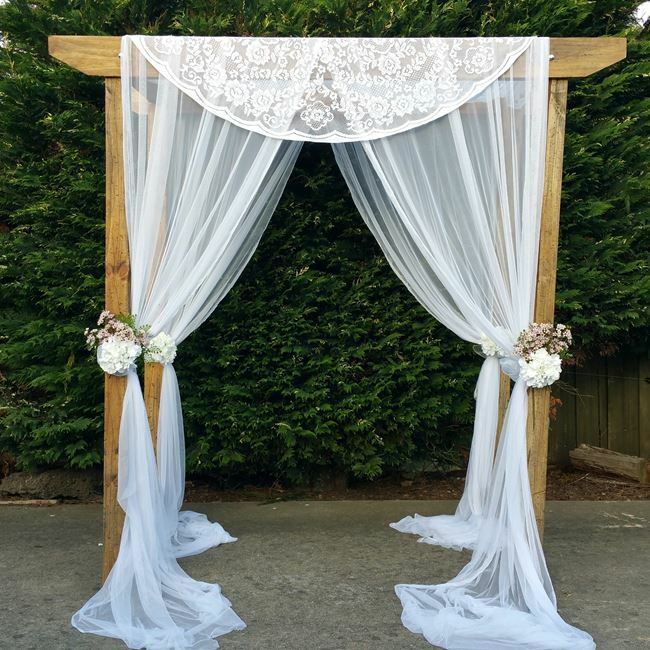 draping white material included. 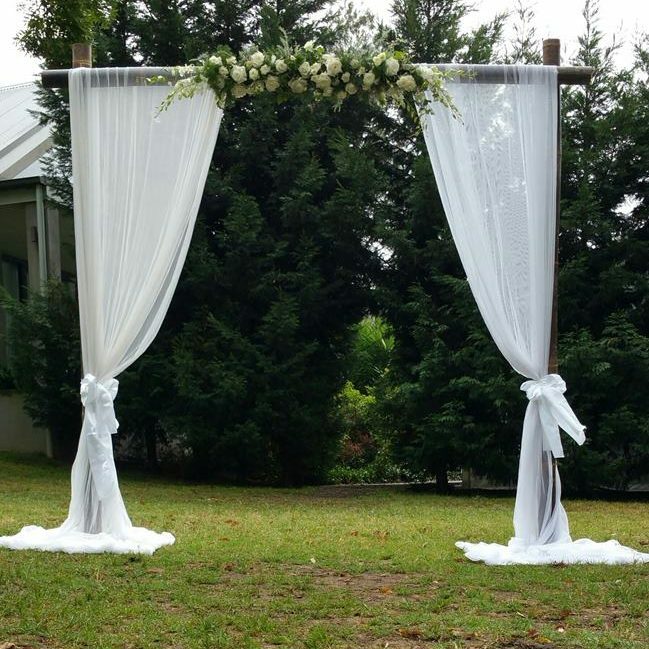 Styled with artificial flowers $290.00 Delivery and set up/pack down fee apply To save on costs this is also available as a DIY option for you to pick up yourselves. 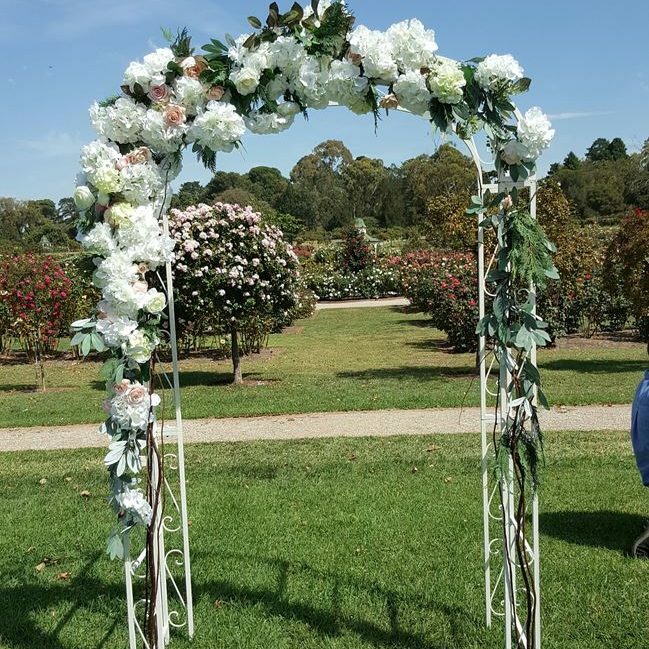 WEDDING ARCH HIRE 63 White metal wedding arch with white hydrangea Styled with artificial flowers $290.00 Delivery and set up/pack down fee apply To save on costs this is also available as a DIY option for you to pick up yourselves. 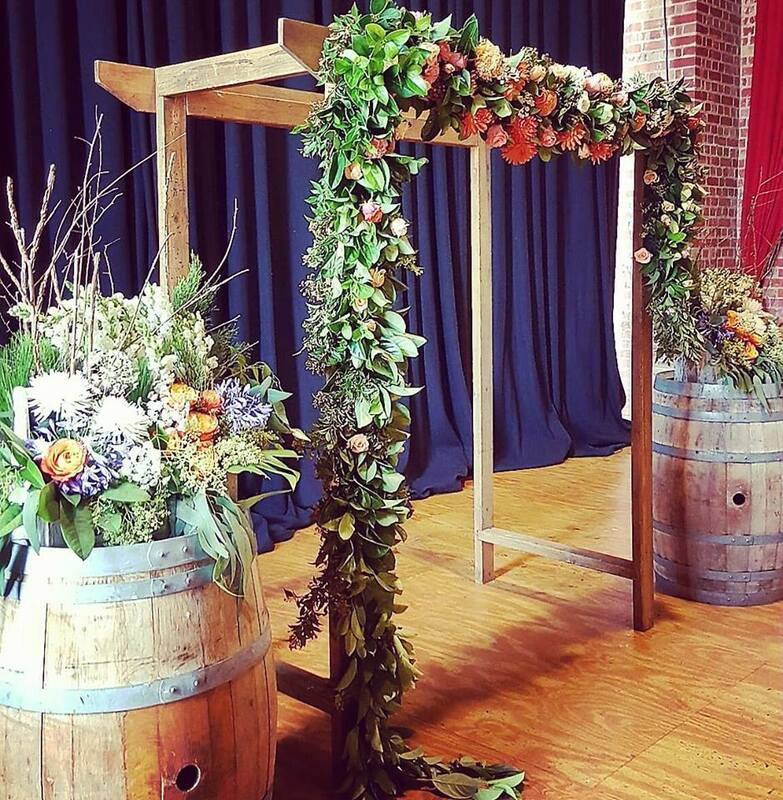 WEDDING ARCH HIRE 66 Timber wedding arbour with fresh flowers and foliage across the top bar. 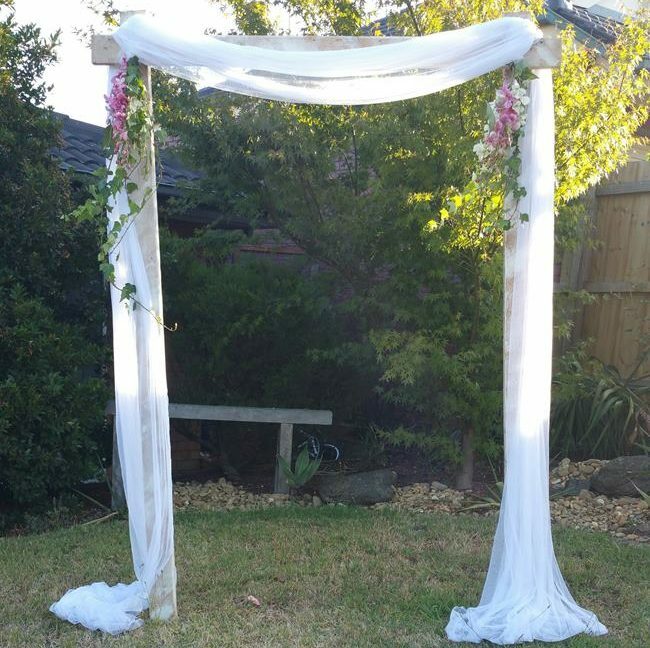 $450 Delivery and set up/pack down fee apply To save on costs this is also available as a DIY option for you to pick up yourselves. 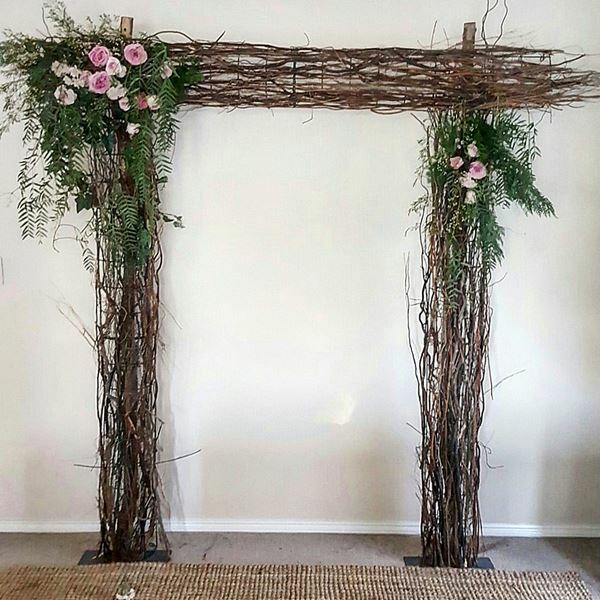 WEDDING ARCH HIRE 70 Willow wedding arbour flowers on side corner Styled with artificial flowers $290.00 Delivery and set up/pack down fee apply To save on costs this is also available as a DIY option for you to pick up yourselves. 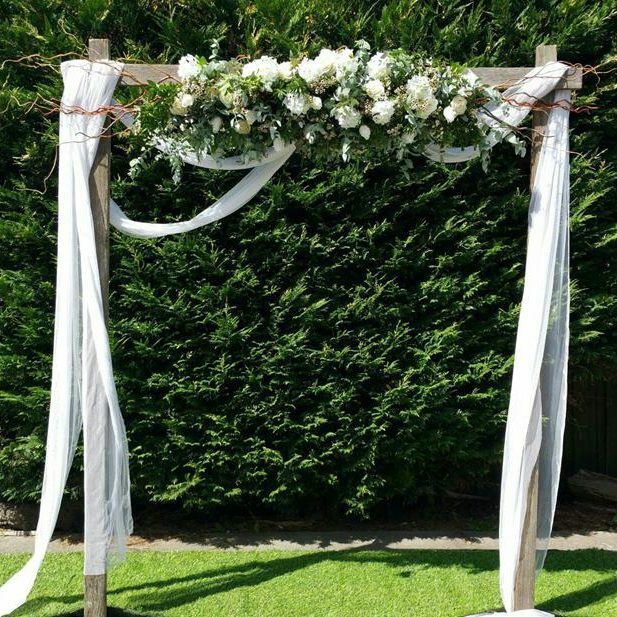 WEDDING ARCH HIRE 72 Vintage Wedding Arbour with lace draping curtains, Climbing Ivy and flowers can be made fresh or artificial. 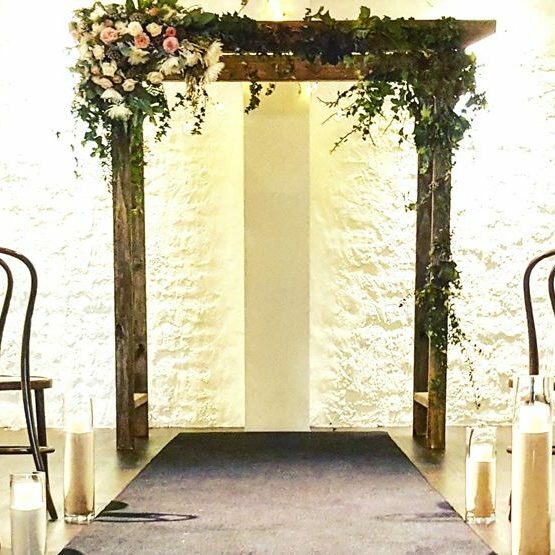 Styled with artificial flowers $290.00 Delivery and set up/pack down fee apply To save on costs this is also available as a DIY option for you to pick up yourselves. 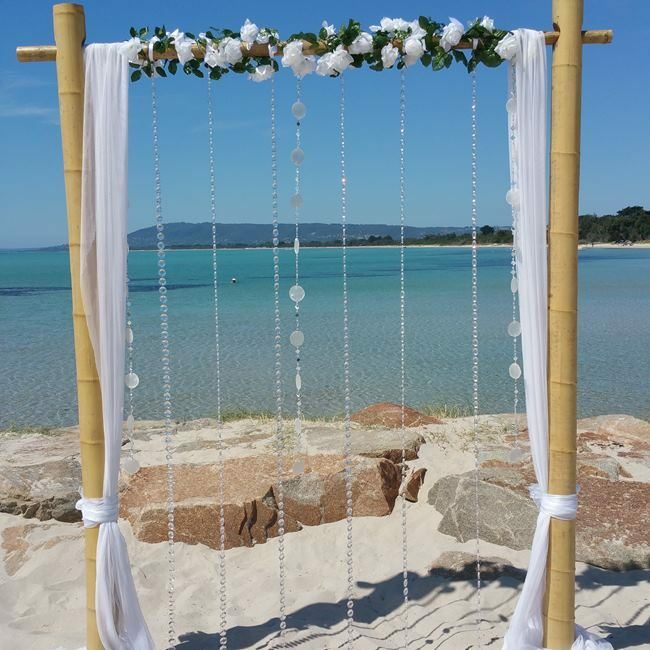 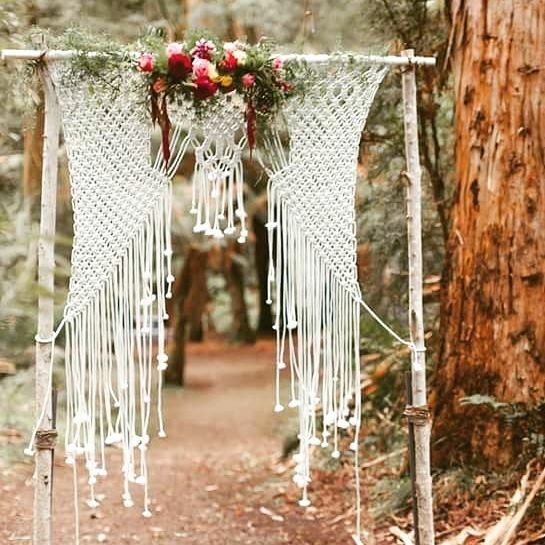 WEDDING ARCH OPTION 73- Macramé Wedding Backdrop includes some flowers in the colour of your choice and greenery Styled with artificial flowers $250.00 Delivery and set up/pack down fee apply To save on costs this is also available as a DIY option for you to pick up yourselves. 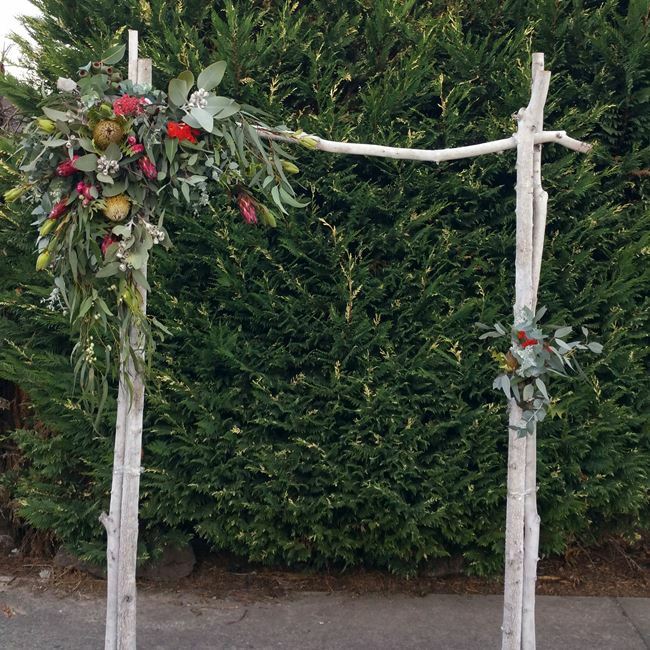 WEDDING ARCH HIRE 75 Willow wedding arbour with fresh flowers and foliage across the top and down one side. 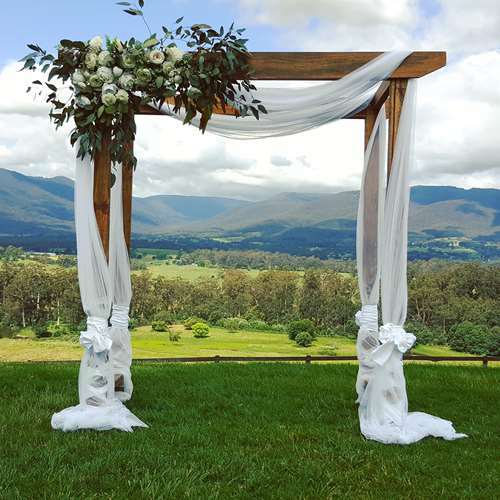 Styled with fresh flowers from $590.00 Delivery and set up/pack down fee apply To save on costs this is also available as a DIY option for you to pick up yourselves. 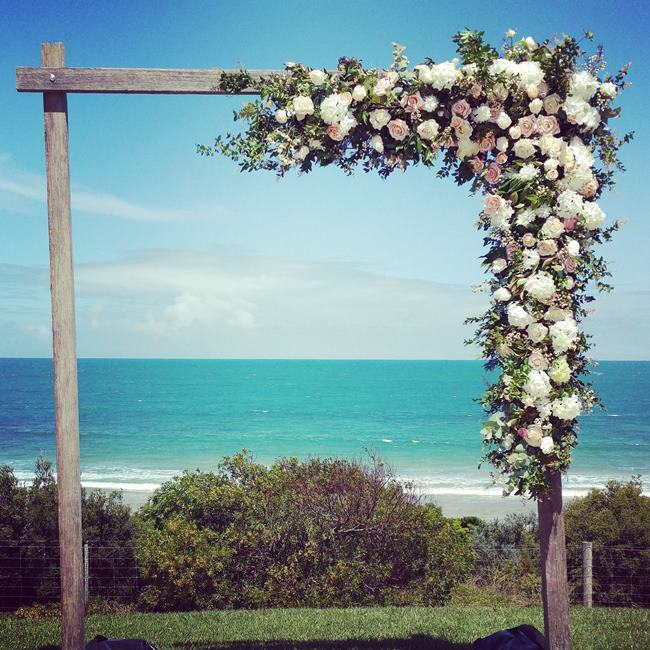 WEDDING ARCH HIRE 79 Moon Arch with flowers Styled with artificial flowers $320.00 Delivery and set up/pack down fee apply To save on costs this is also available as a DIY option for you to pick up yourselves. 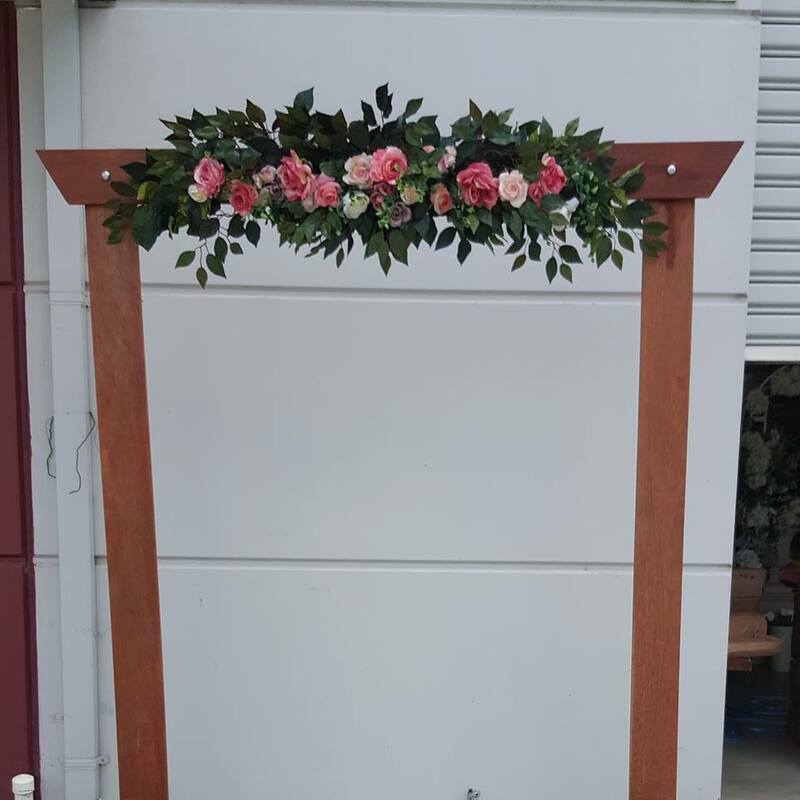 WEDDING ARCH HIRE 81 White wash timber wedding arch with white material and 2 flowers on both sides Styled with artificial flowers $320.00 Delivery and set up/pack down fee apply To save on costs this is also available as a DIY option for you to pick up yourselves. 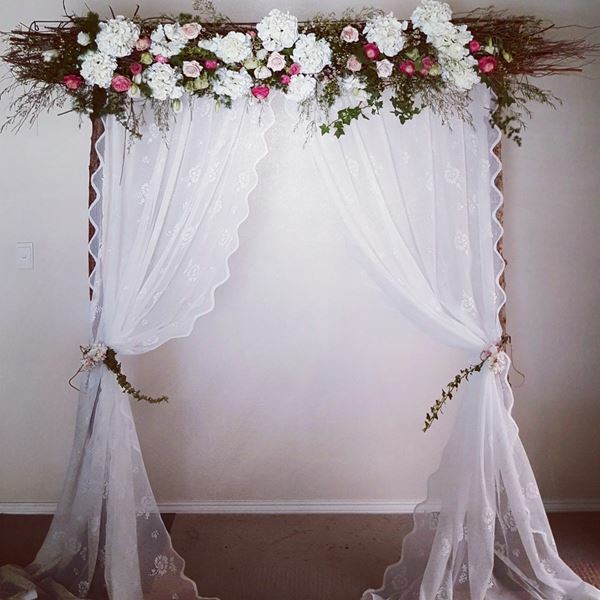 WEDDING ARCH HIRE 82 Natural branches with white material swagging and flowers on both sides Styled with artificial flowers $290.00 Delivery and set up/pack down fee apply To save on costs this is also available as a DIY option for you to pick up yourselves. 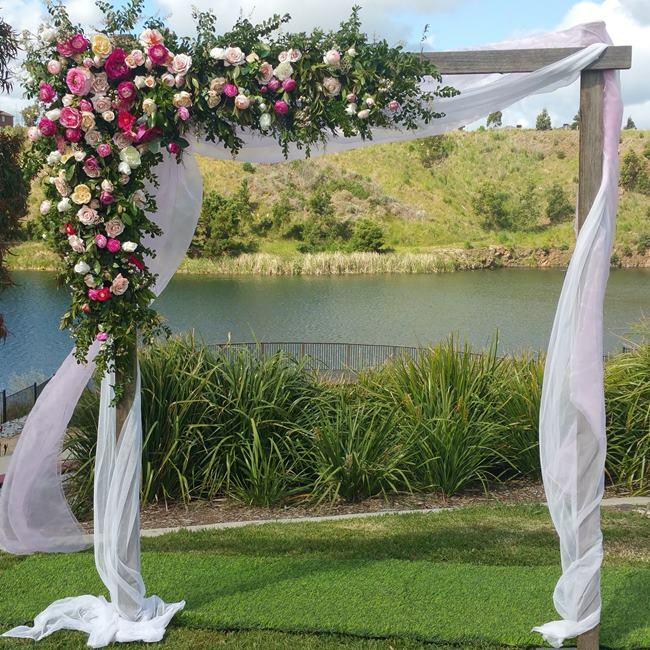 WEDDING ARCH HIRE 88Rose gold wedding arch with flowers on the top point Styled with artificial flowers $250.00 Delivery and set up/pack down fee apply To save on costs this is also available as a DIY option for you to pick up yourselves. 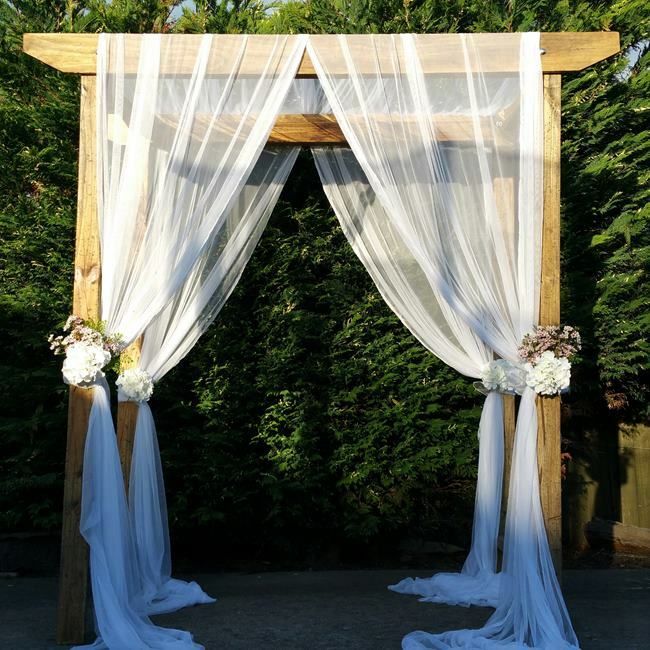 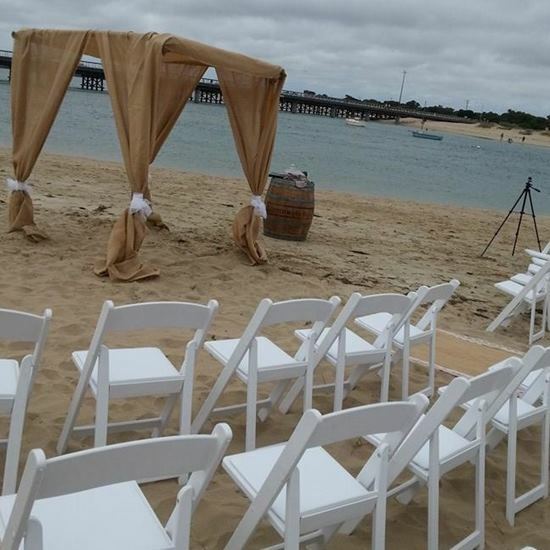 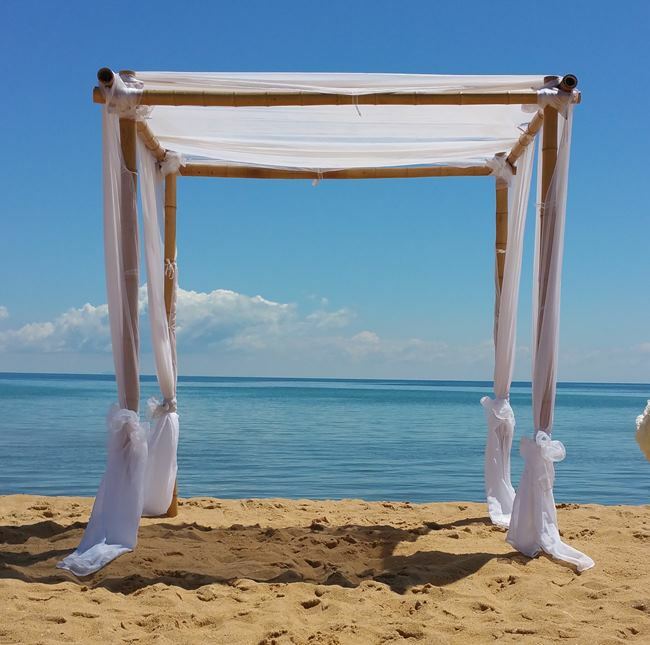 All of our wedding arches are designed and built with the outdoor wedding in mind. 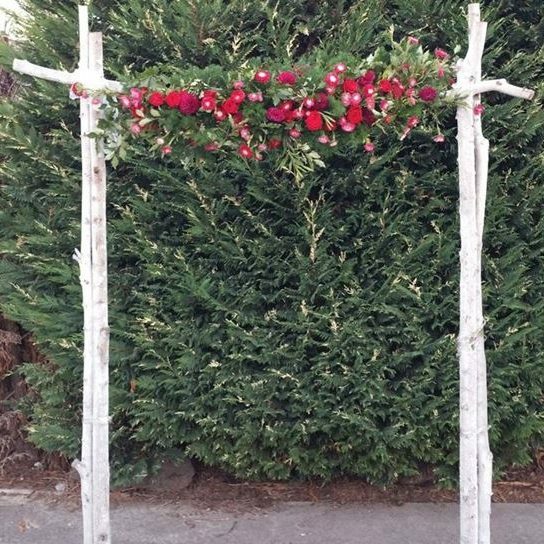 Most Gardens will not allow staking due to irrigation. 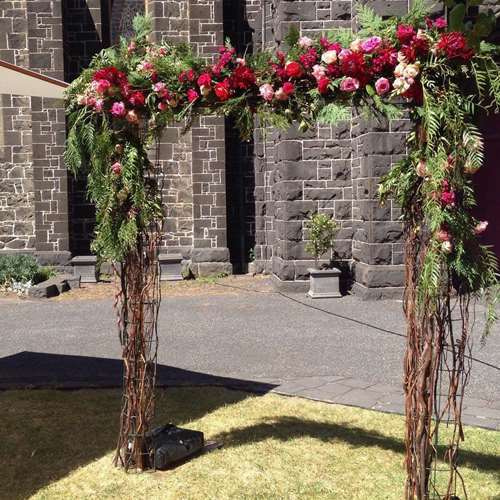 For his reason none of our wedding arches for hire require staking. 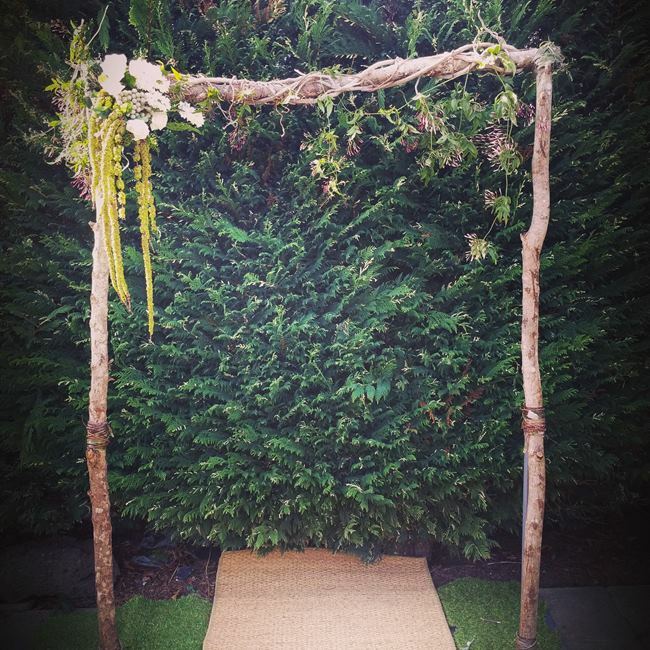 Most of our wedding arches are available for DIY wedding hire….. Due to their fragile nature, The Bamboo Canopy and Bamboo Wedding Arch are not for DIY hire. 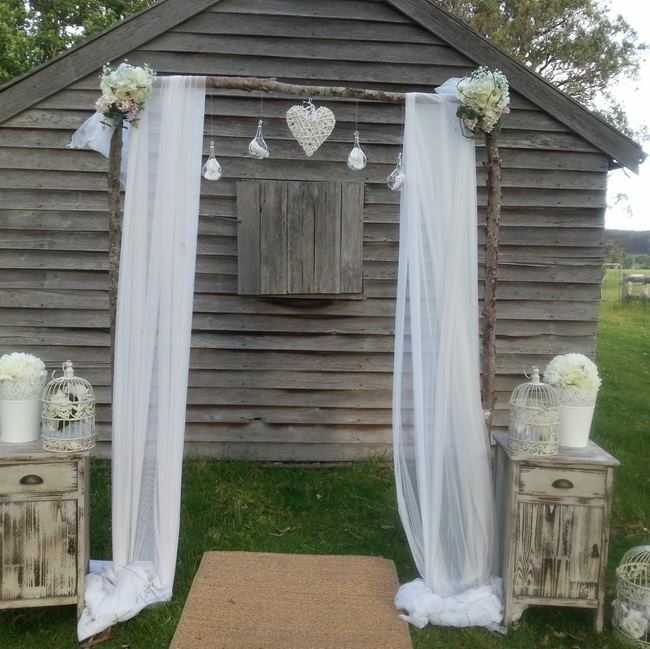 Let us know your requirements and we would be happy to send through a quote for full delivery and set up. 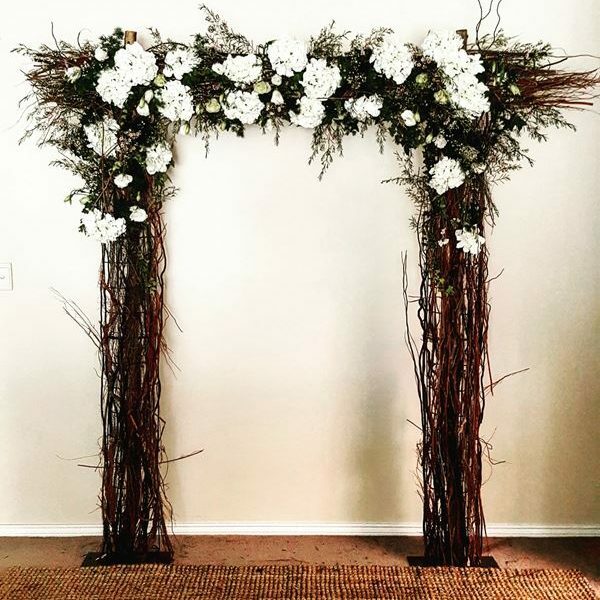 Which Wedding Arch Option are you interested in and how you are wanting it to look? 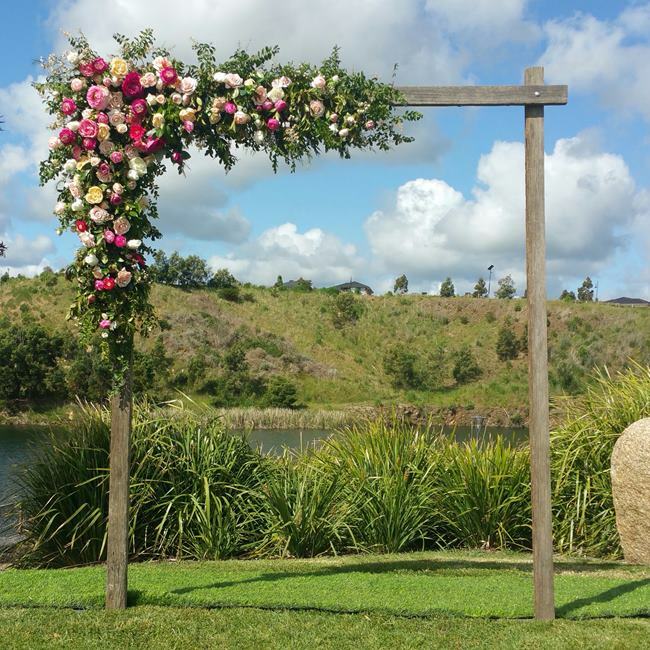 If your wedding arch or Arbor requires flowers which would you prefer? 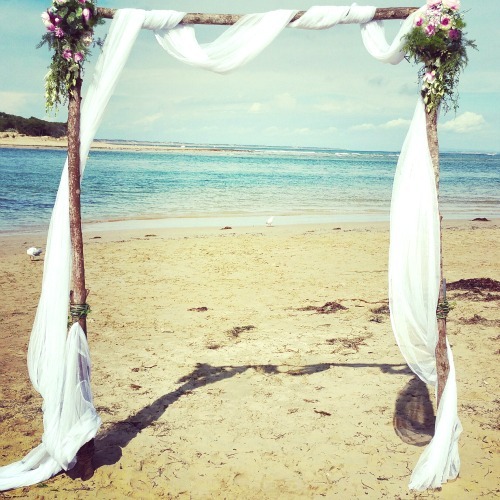 If you have something in mind that you would like to show us, you can upload it here. 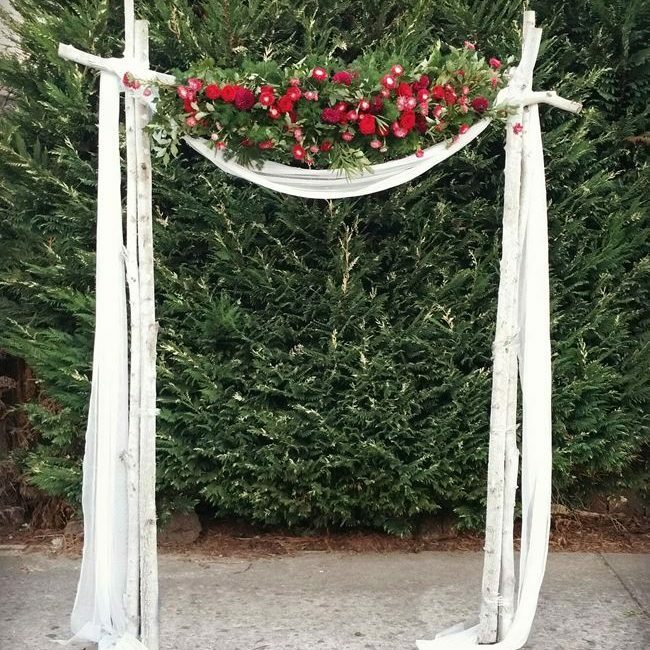 If you haven’t seen anything that you like Send us a picture of what you have in mind. 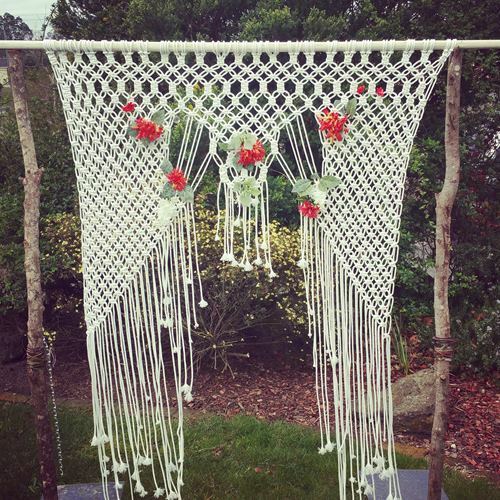 We love creating new and exciting things. 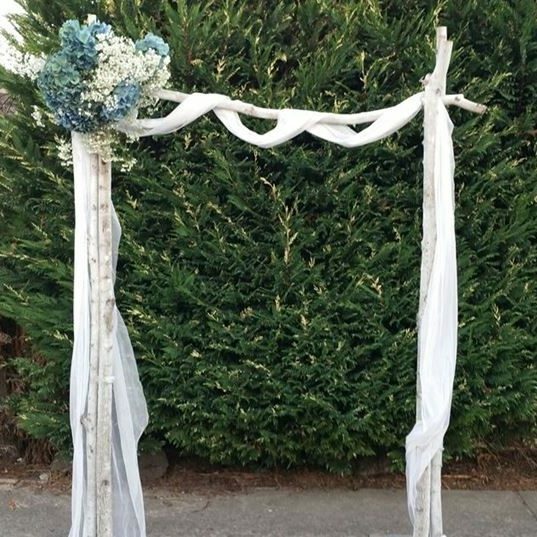 A custom made wedding arch is right up our ally. 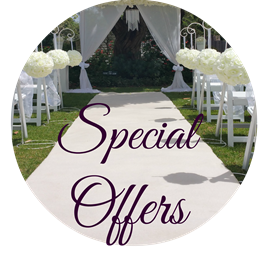 Chances are, we can create that special look you are after. 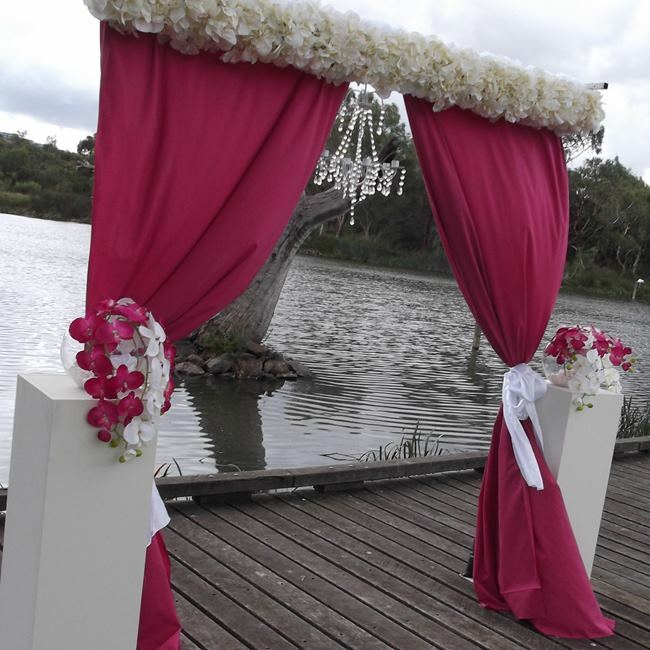 if you need more ideas on what you may like have a look at the wedding arch ideas on Pintrest. 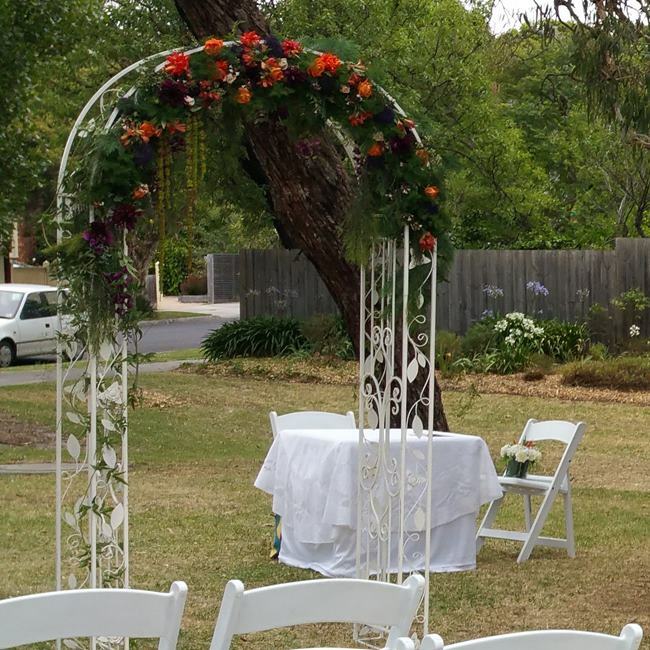 If you are still looking for some ideas have a look at our Facebook Page. 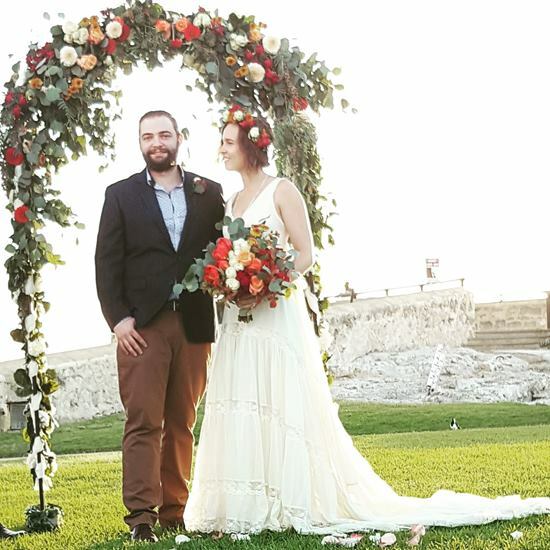 We often post pictures of our recent weddings. 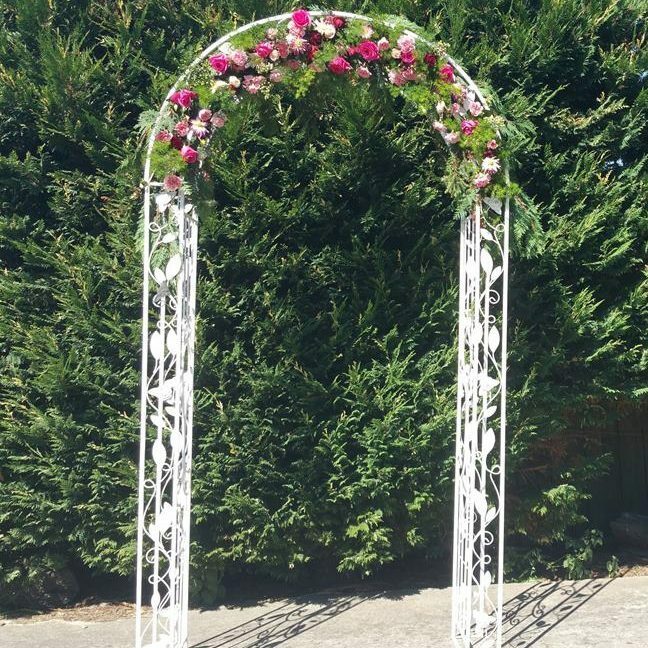 Please contact us for prices and delivery for wedding arch hire out of these regions. 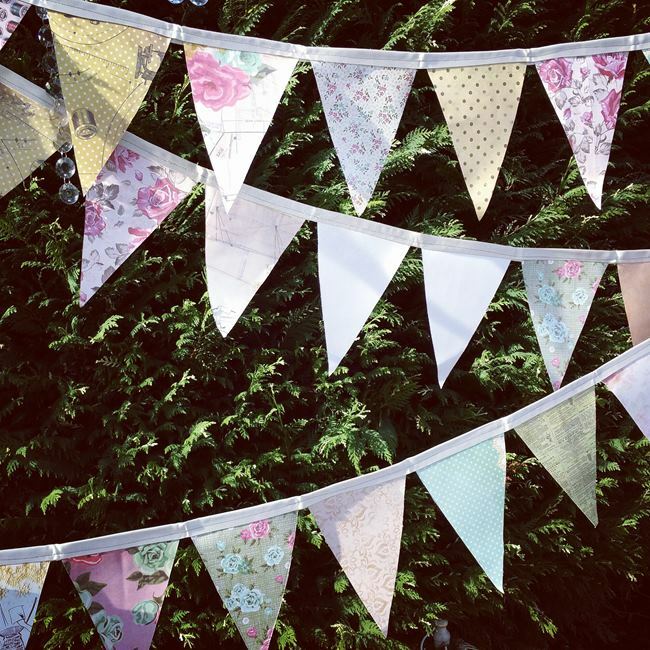 DIY Pick ups are in Hallam.